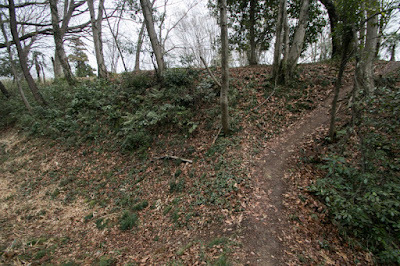 Musashi Matsuyama castle (武蔵松山城) is located on a Shiroyama hill in Yoshimi town, at the middle part of Saitama prefecture. 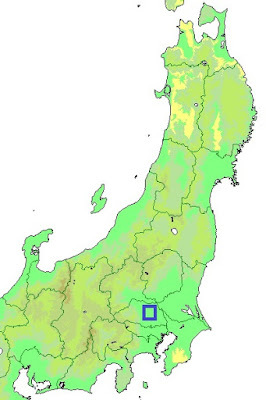 Yoshimi area locates at western side of Arakawa river, and is applicable to a corner where the river originally flows from Chichibu mountains toward east turns southward. In addition to this, Yoshimi area is a hilly area spreads into low area like a beak, thus it was a great place to build a castle. 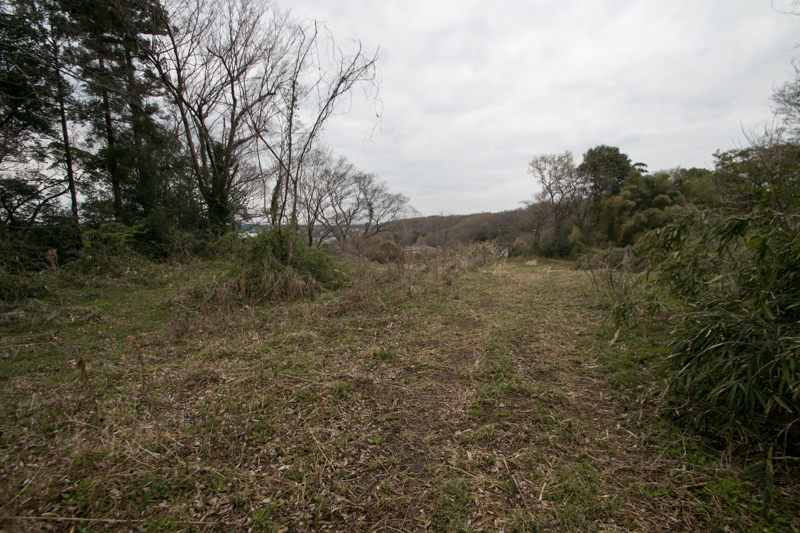 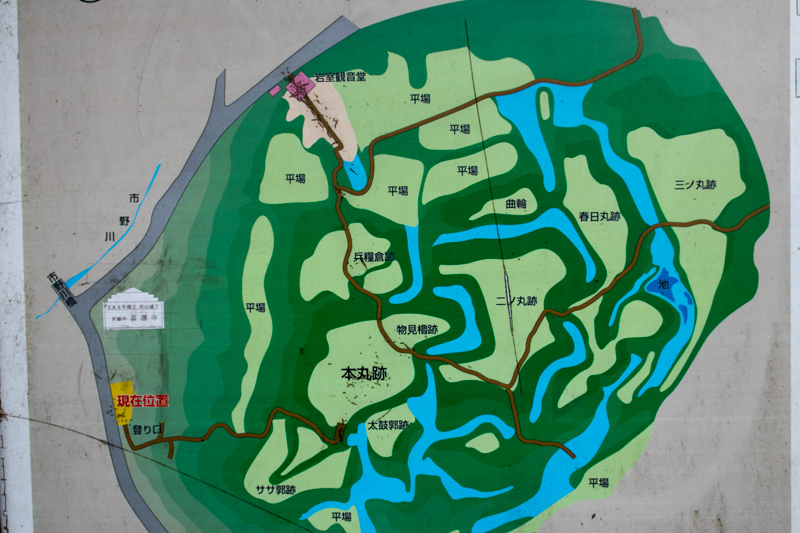 Historically, east part of current Saitama prefecture surrounded by Tonegawa river and Arakawa river was a muddy area not suitable , and strong warlords spreads either bank of these two rivers. 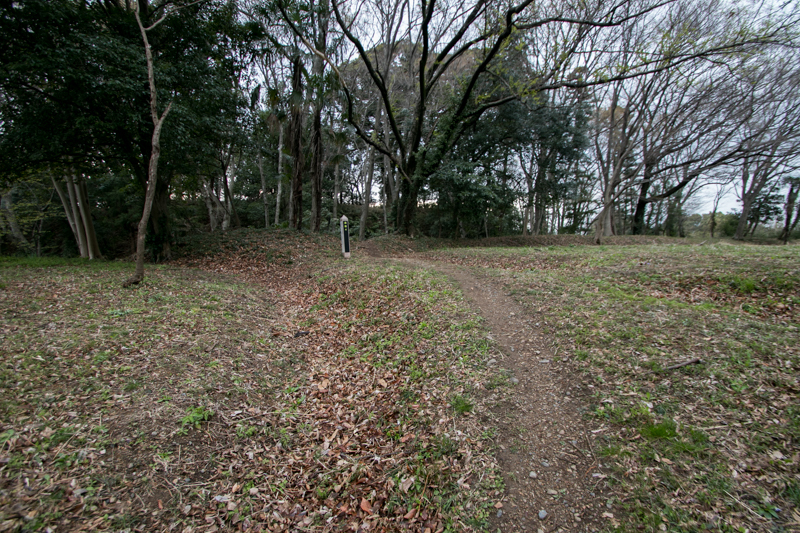 In 15th century, Doukan Ota (1432-1486), a great general of Ogigayatsu Uesugi clan and is known for built Edo castle for the first time, established a defense line along with western riverside of Arakawa river consist of Hachigata castle, Musashi Matsuyama castle, Kawagoe castle and Edo castle, to protect Sagami province (Kanagawa prefecture) against northward and eastward enemies such as Koga Kubo house or Yamanouchi Uesugi clan. 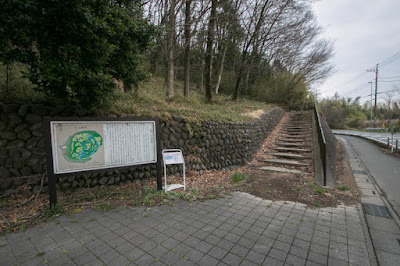 After the fall of Ogigayatsu Uesugi clan, Hojo clan which seized Sagami province also used this defense line against Kenshin Uesugi (1530-1578), the warlord of Echigo province (Niigata prefecture) who was asked from Yamanouchi Uesugi clan to recover their territory. As Uesugi army sent their army and supplies from Kozuke province (Gunma prefecture) by Tonegawa river, the area between Tonegawa river and Arakawa river became the target of struggle of both army. 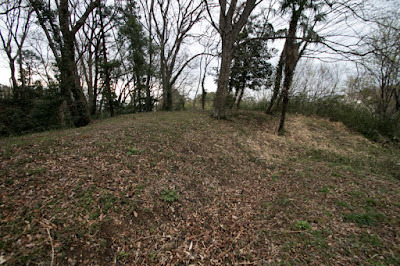 Under such situation, Musashi Matsuyama castle exactly became a cornerstone for Hojo territory and had been involved into many battles. Musashi Matsuyama castle is said to be built in the latter half of 15th century. 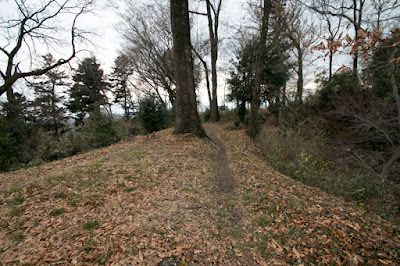 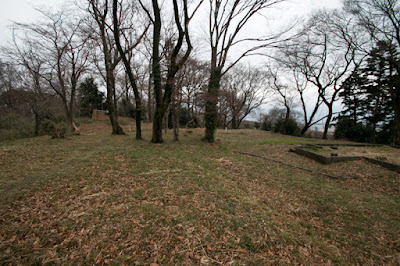 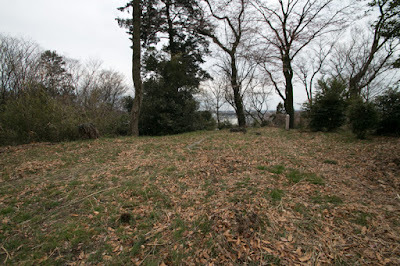 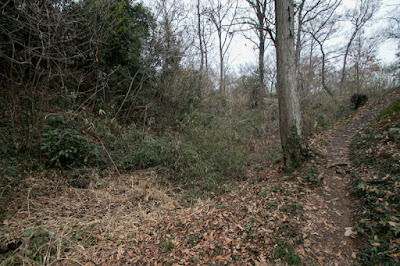 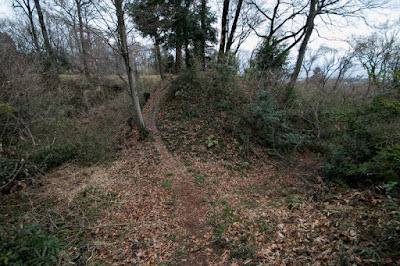 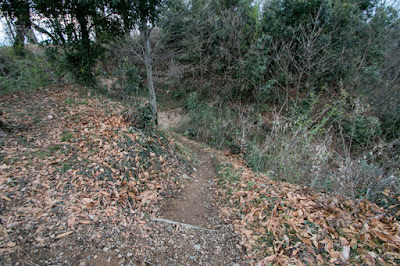 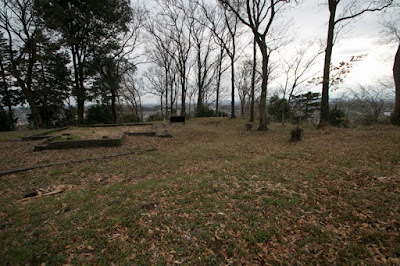 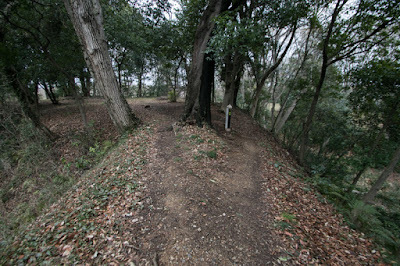 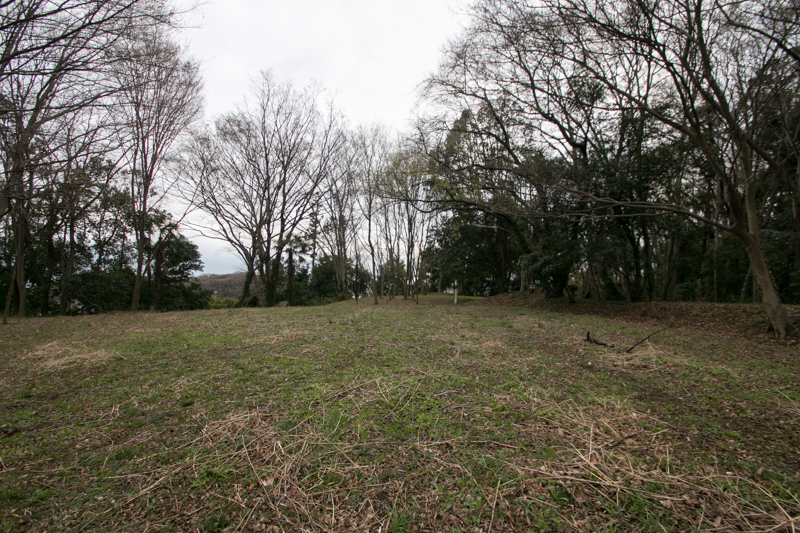 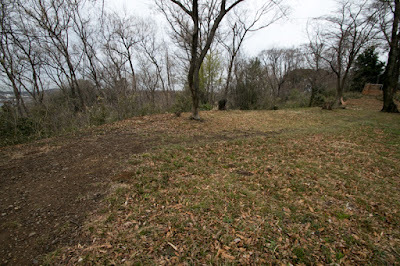 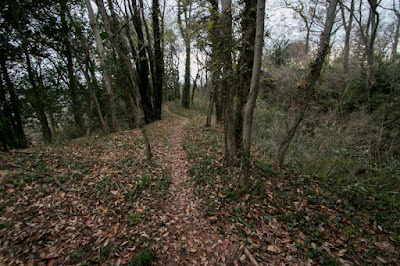 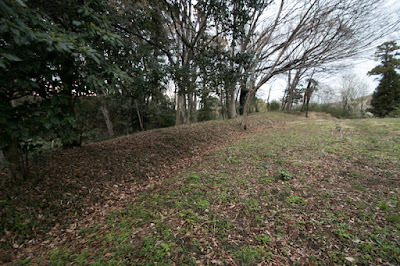 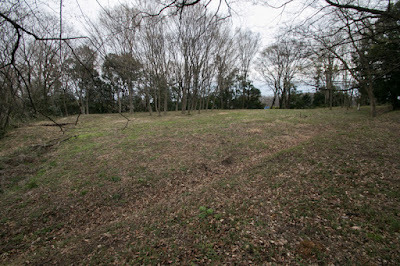 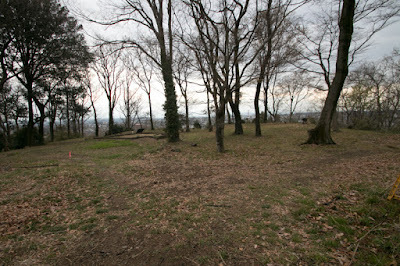 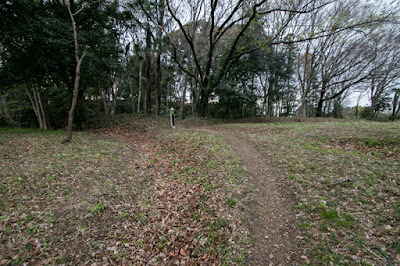 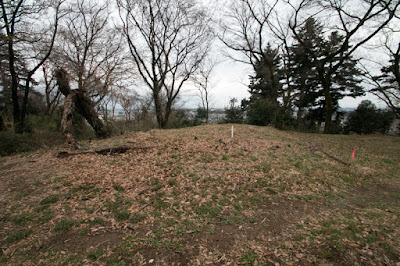 At the beginning of 16th cemtury, Norishige Nanbada (?-1546), a vassal of Ogigayatsu Uesugi clan, governed this castle. 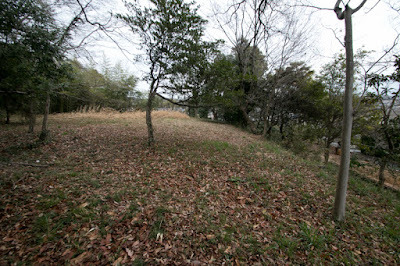 Since 1520’s Ogigayatsu Uesugi clan fiercely fought with Hojo clan, a growing warlord of Sagami province (Kanagawa prefecture), and gradually lost their territory such as Edo castle before Hojo clan. In 1537 Hojyo clan finally captured Kawagoe castle, the residence of Uesugi clan, and Tomosada Uesugi (1525-1546), leader of Uesugi clan, escaped to this castle. 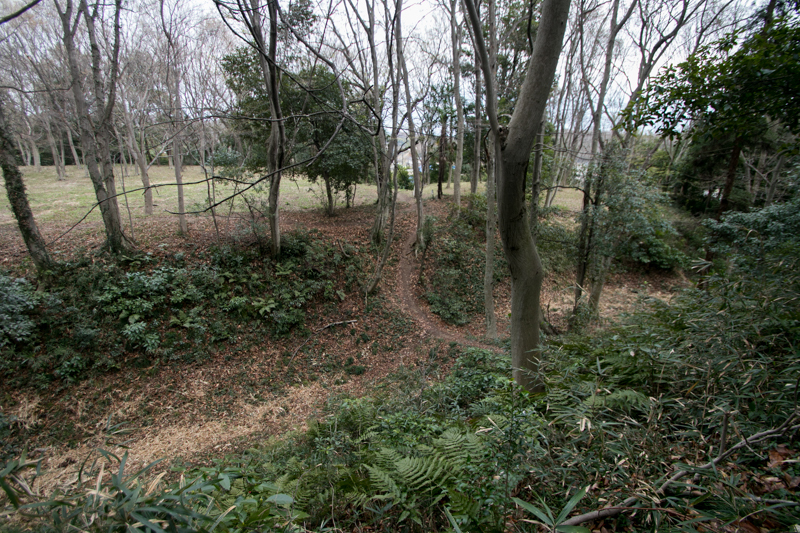 Facing this situation, Norishige significantly expanded this castle as residence of his master, and kept resistance against Hojo clan. 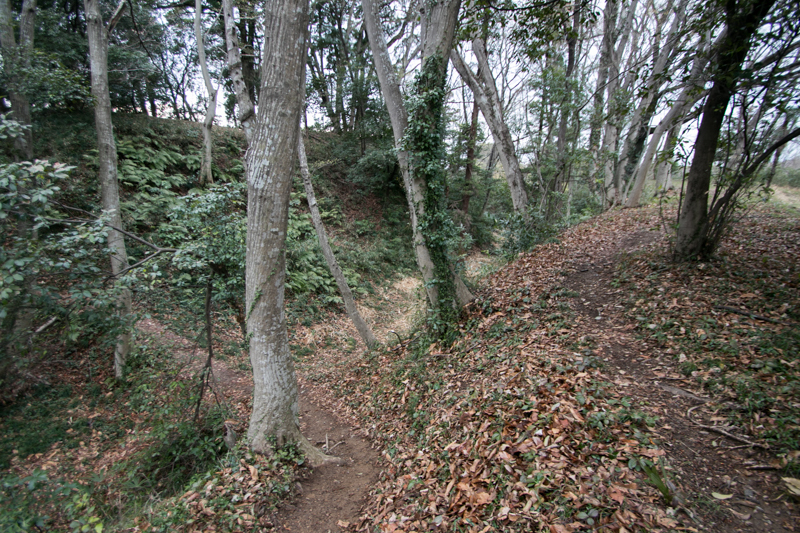 Originally Matsuyama castle was a natural fortress guarded its backside by Ichino river, and at the east slope of the castle opened to outside multiple layer of dry moats were built. 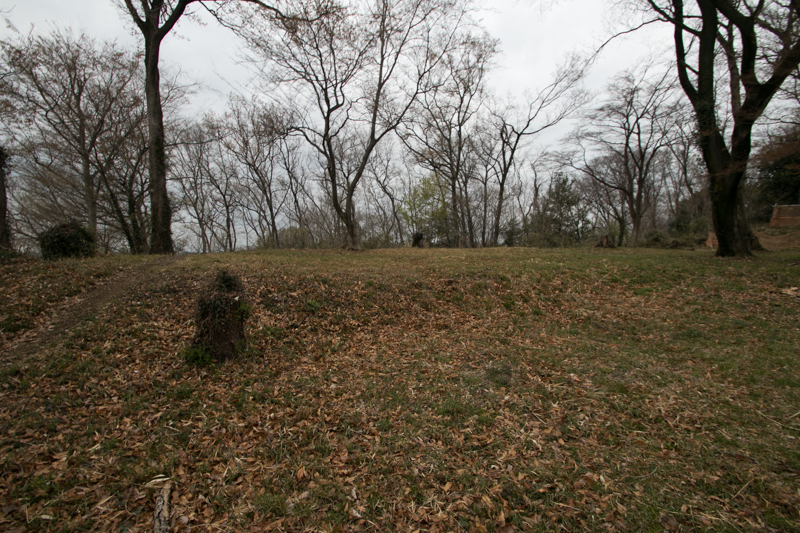 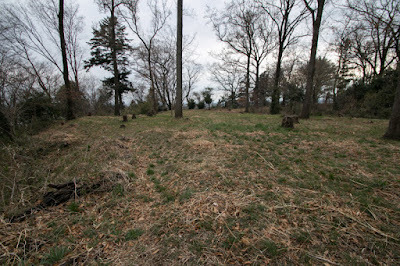 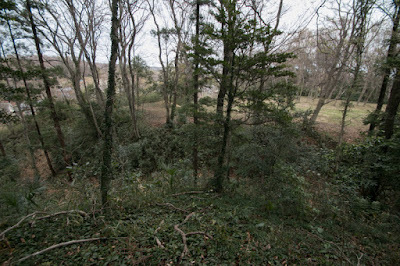 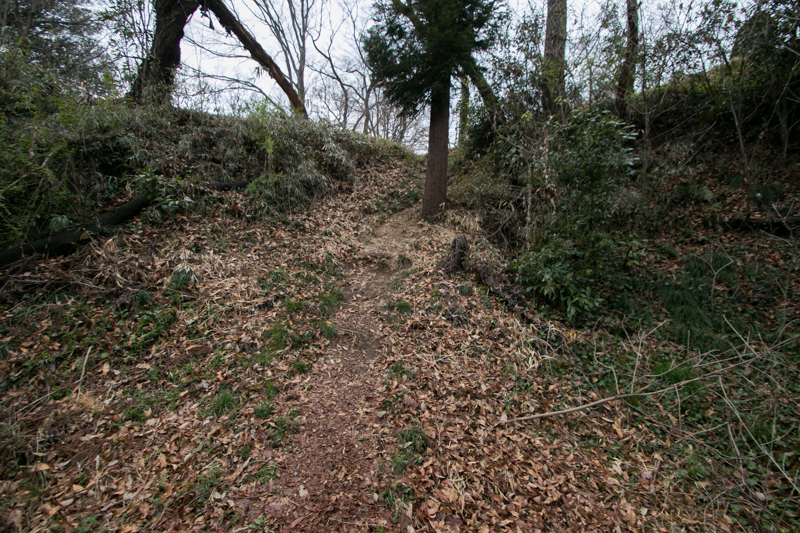 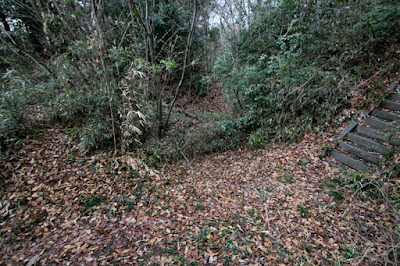 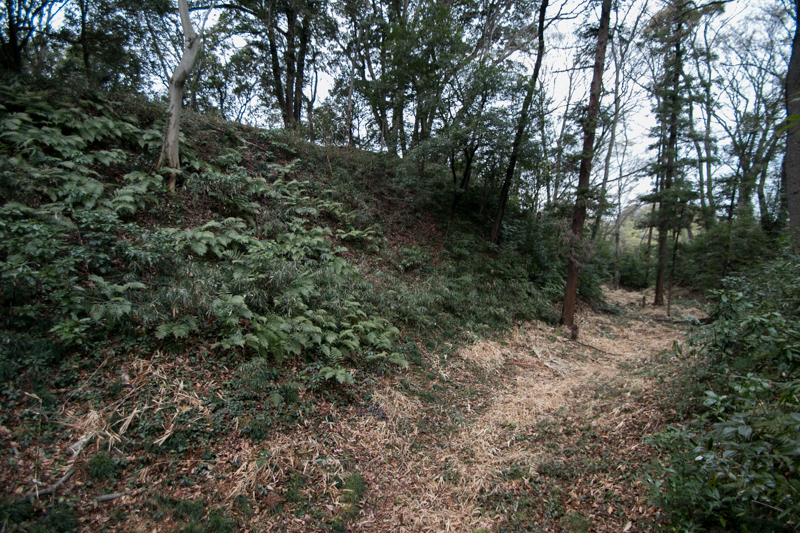 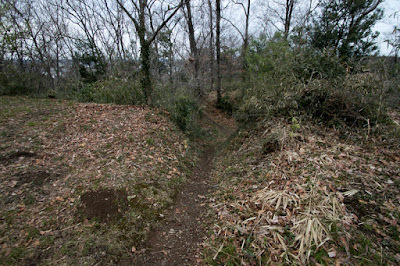 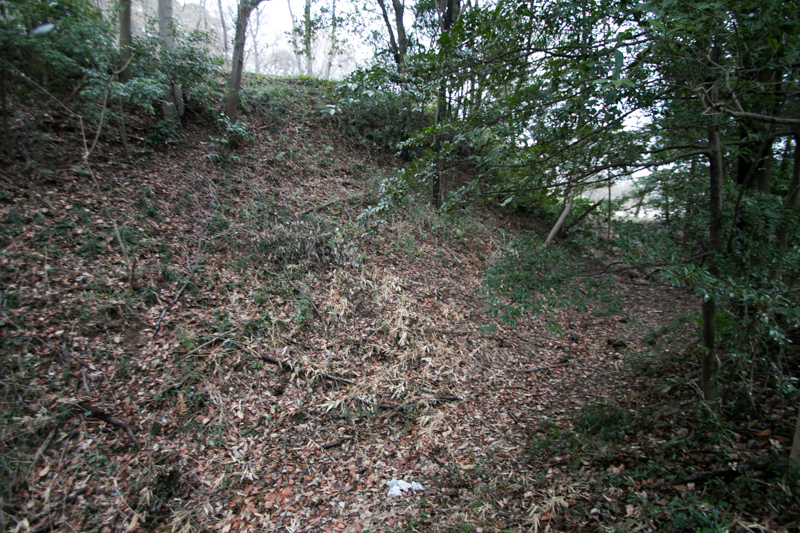 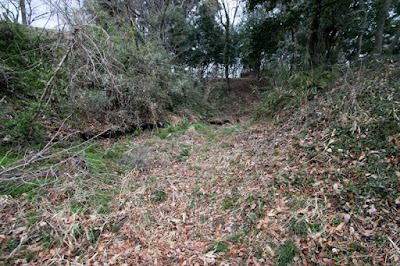 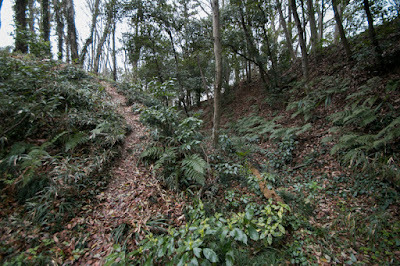 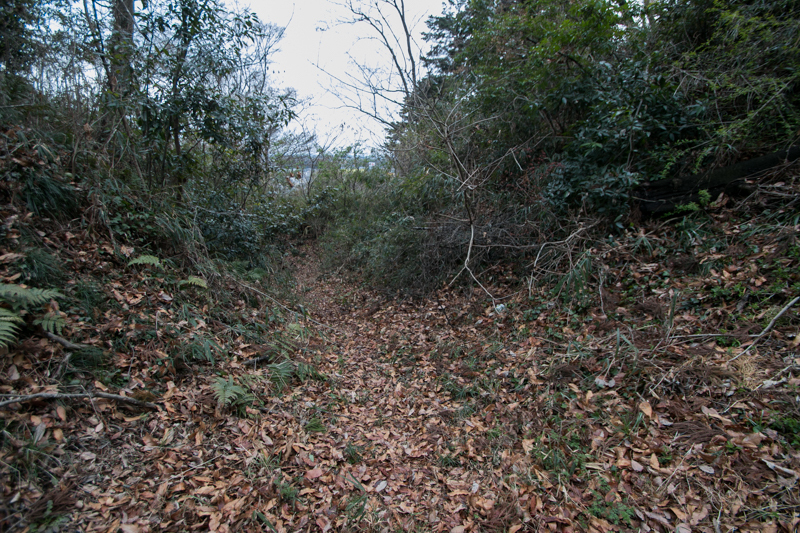 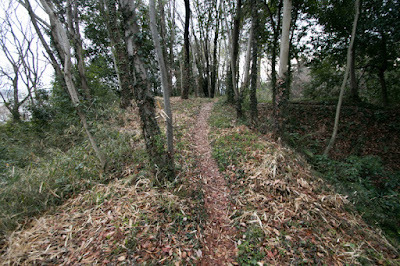 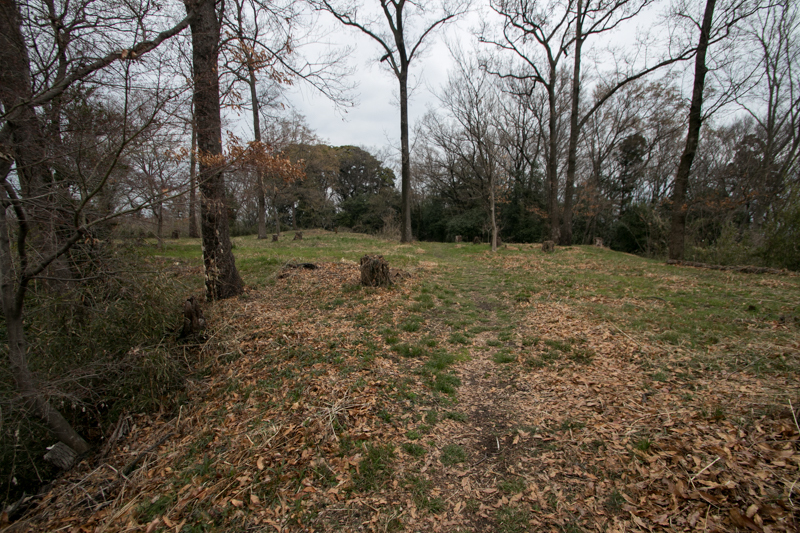 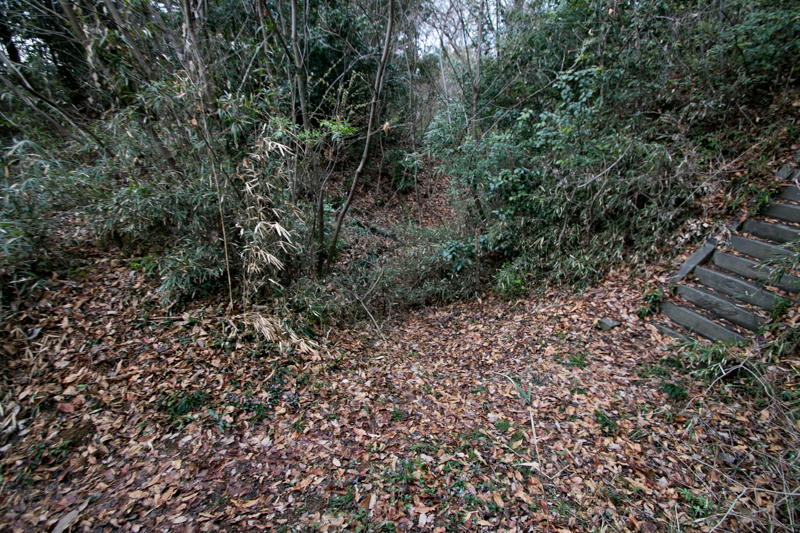 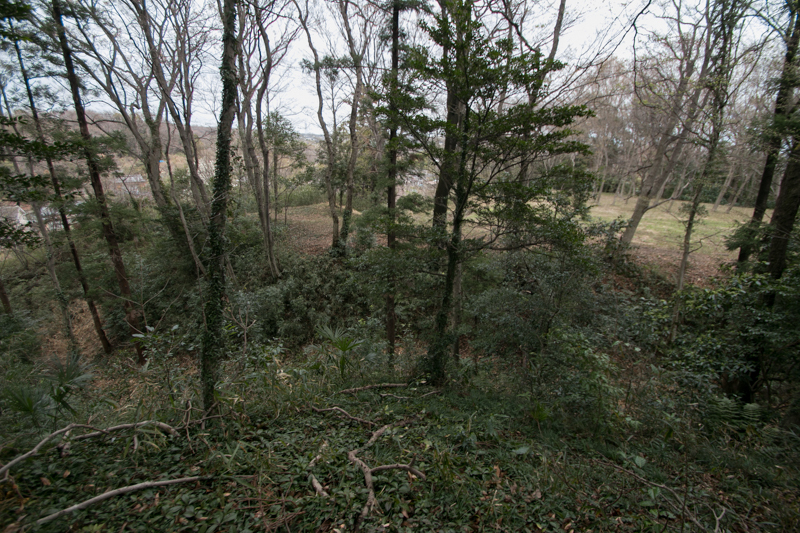 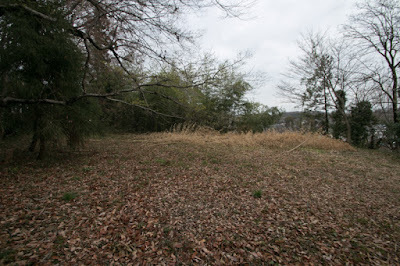 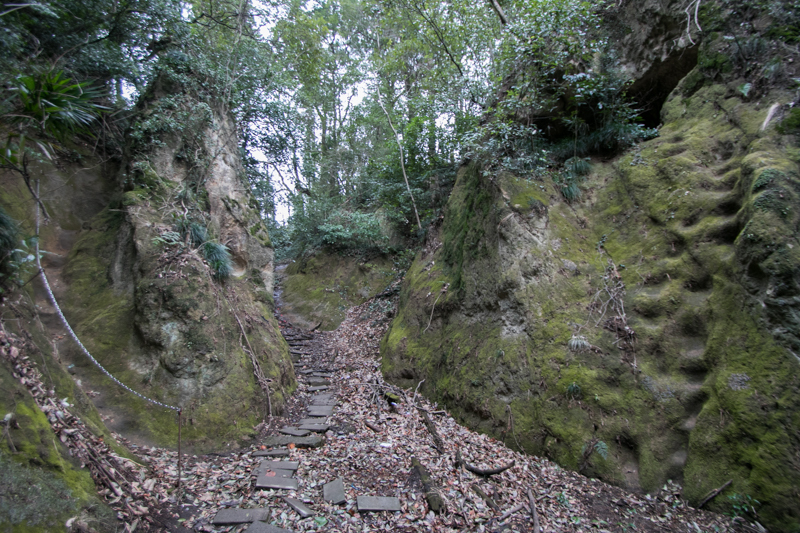 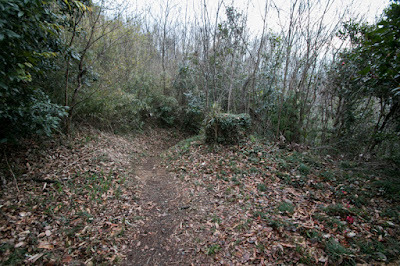 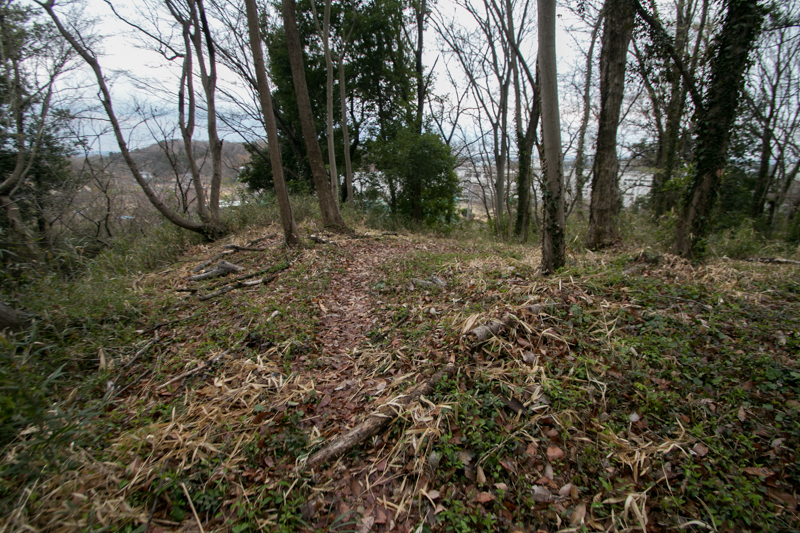 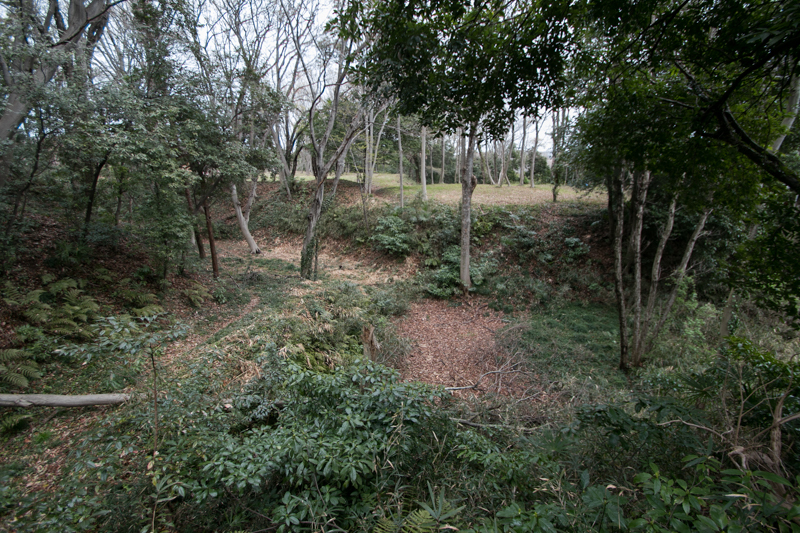 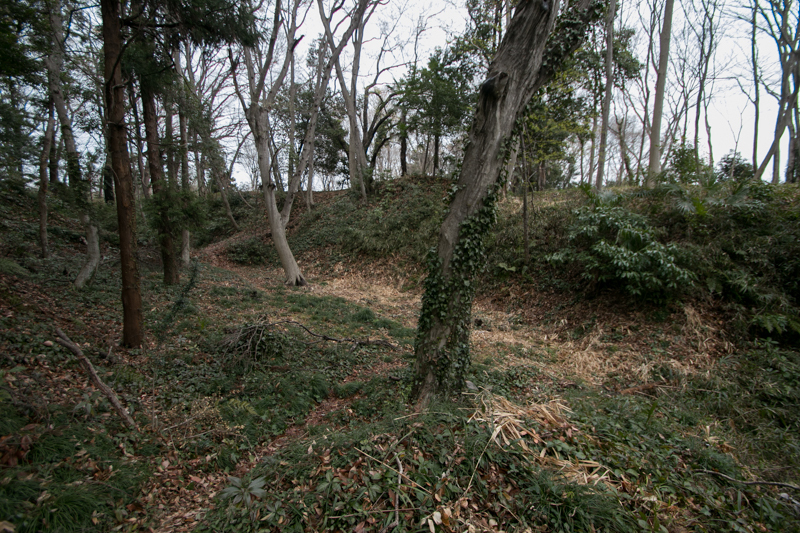 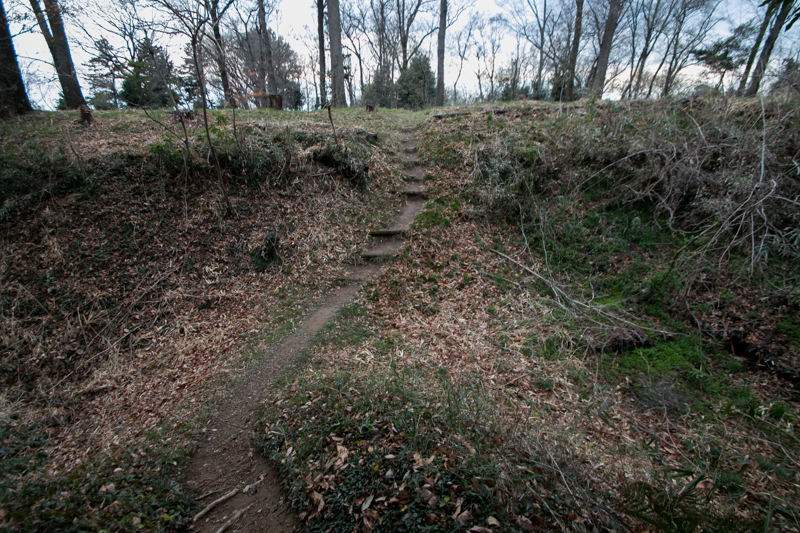 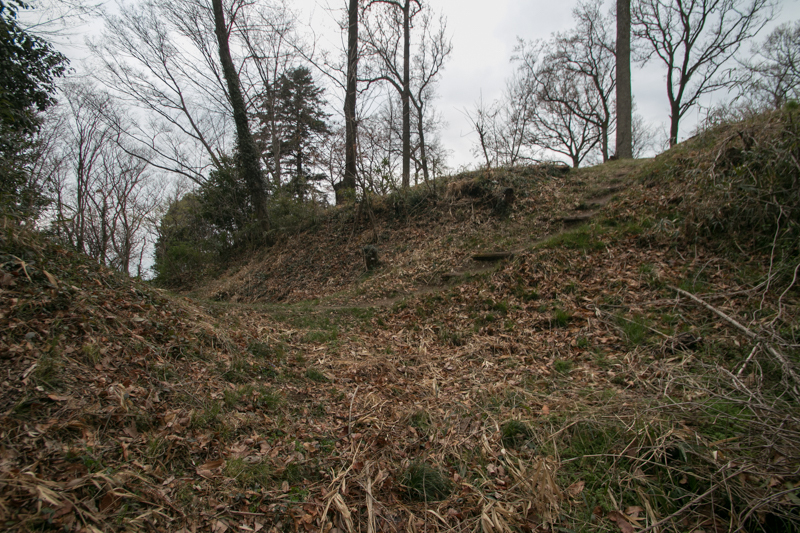 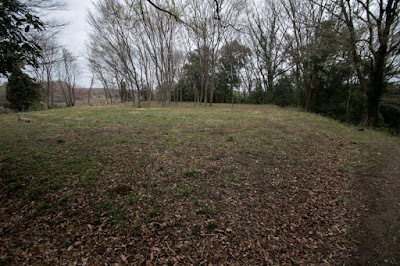 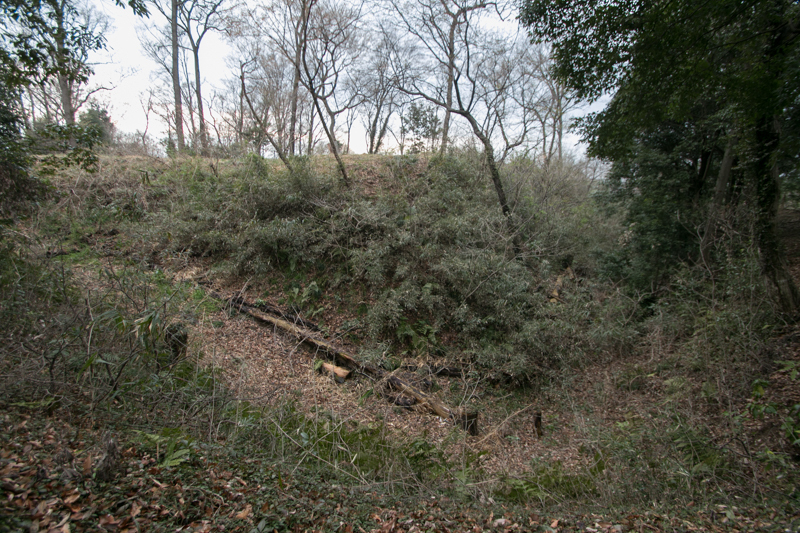 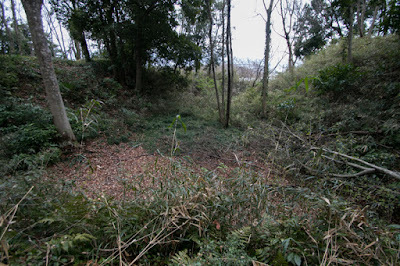 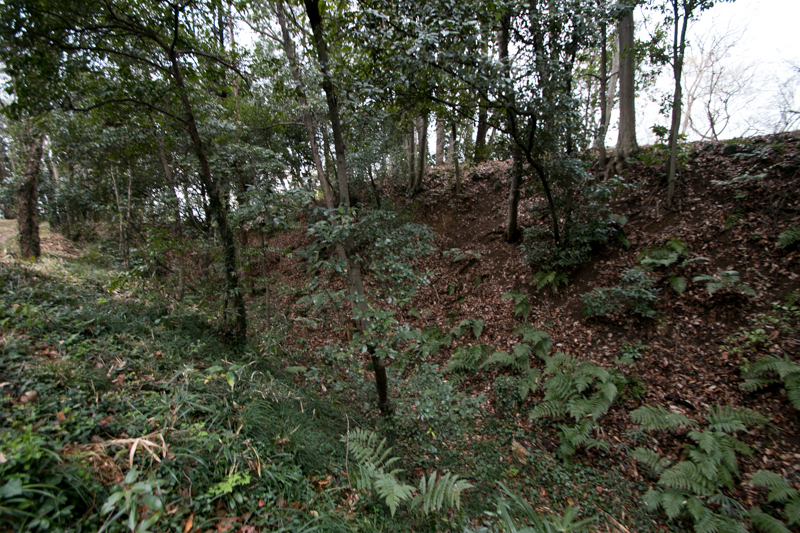 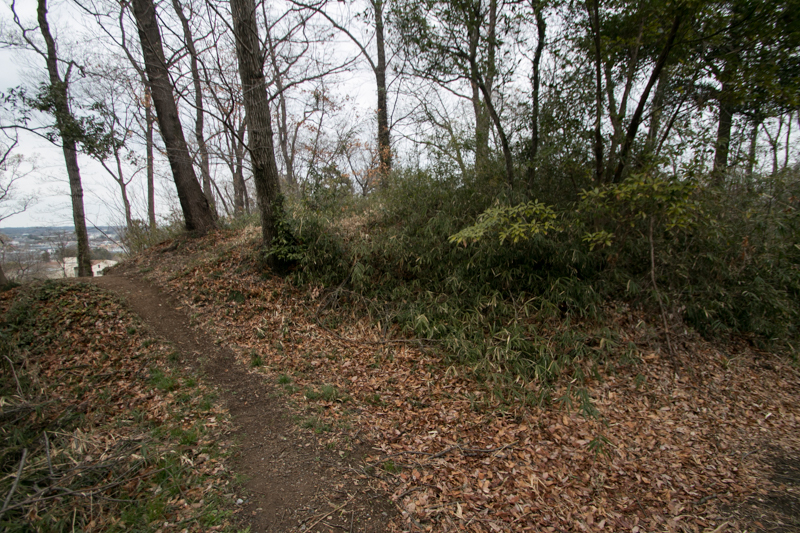 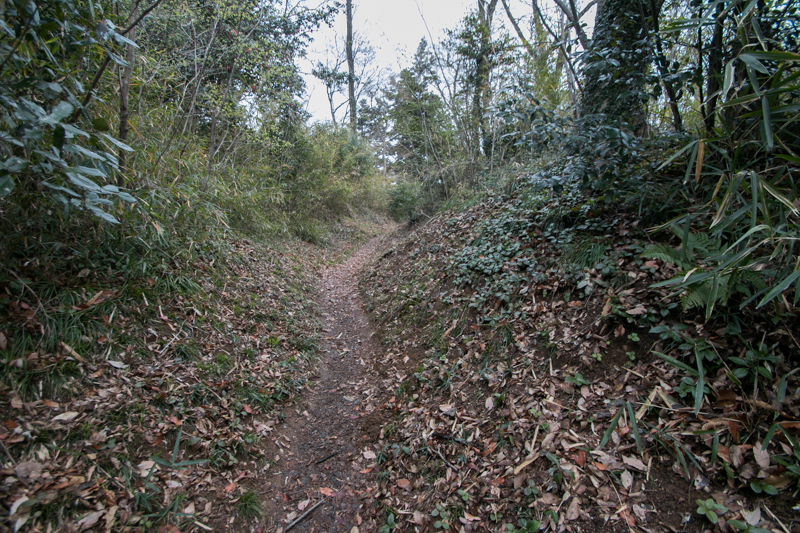 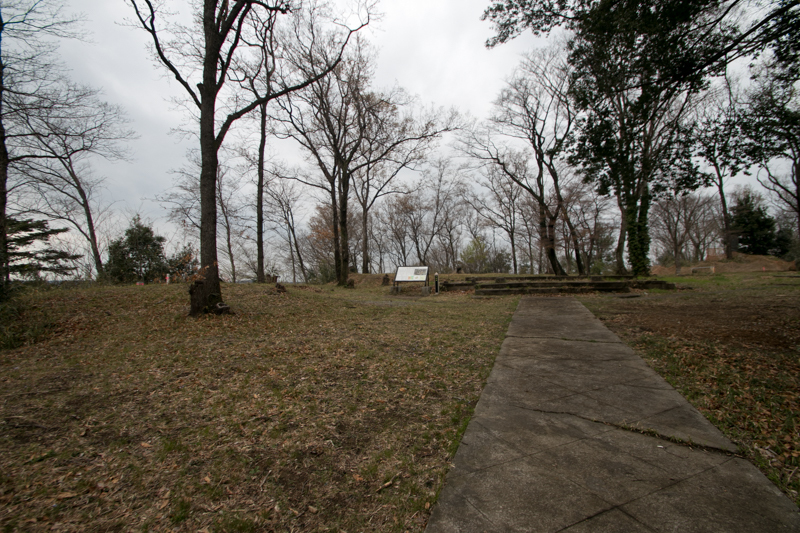 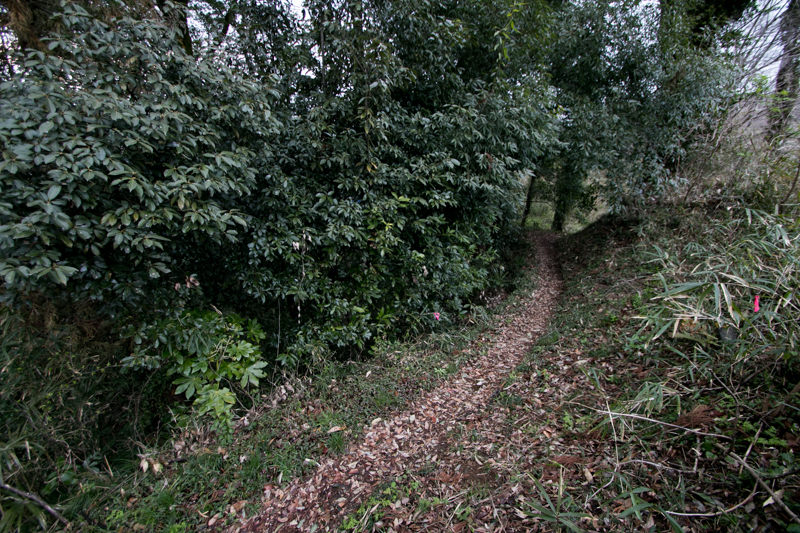 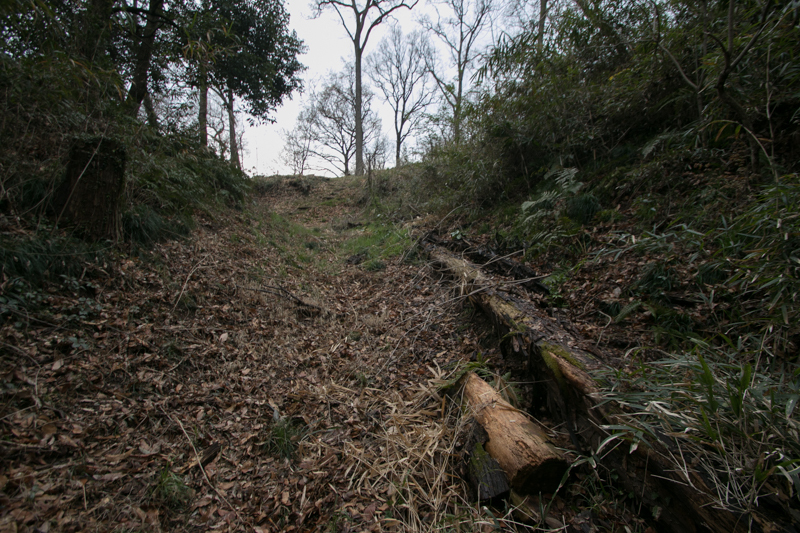 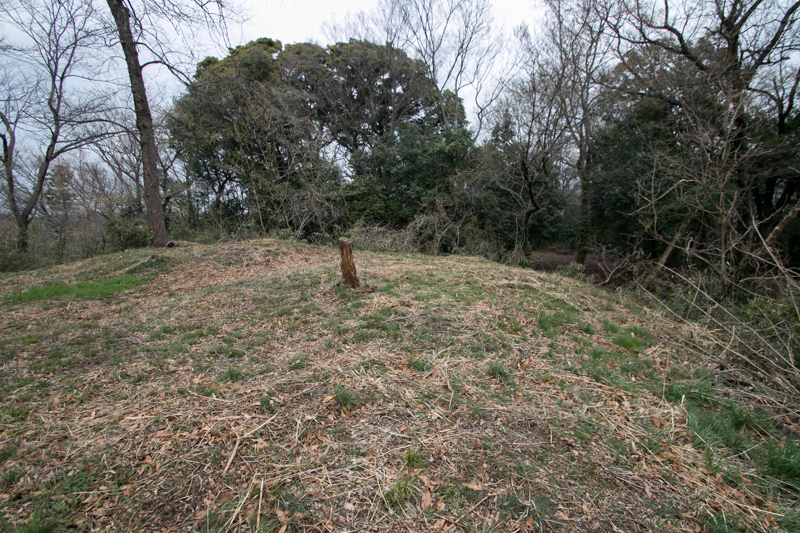 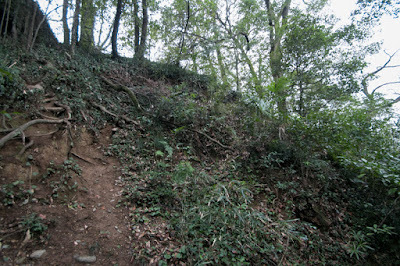 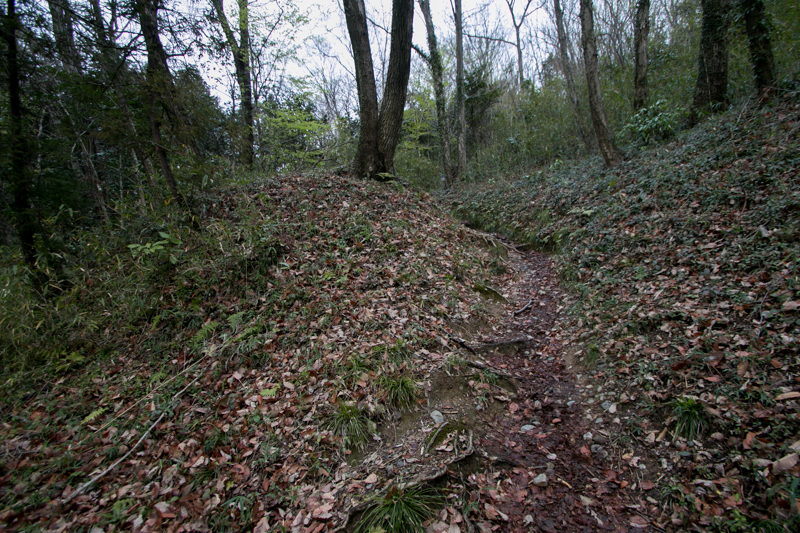 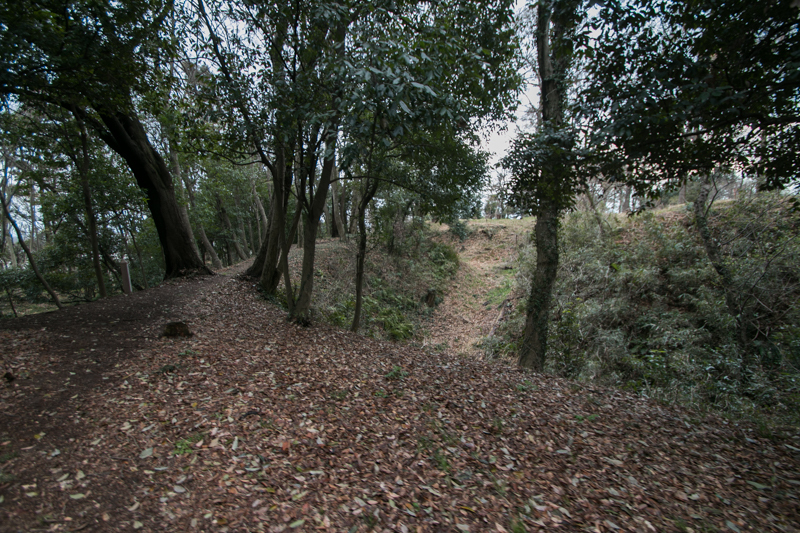 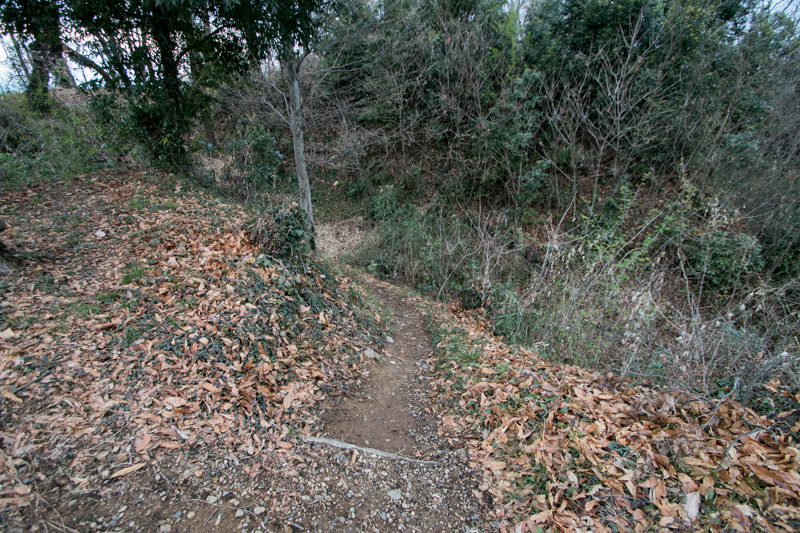 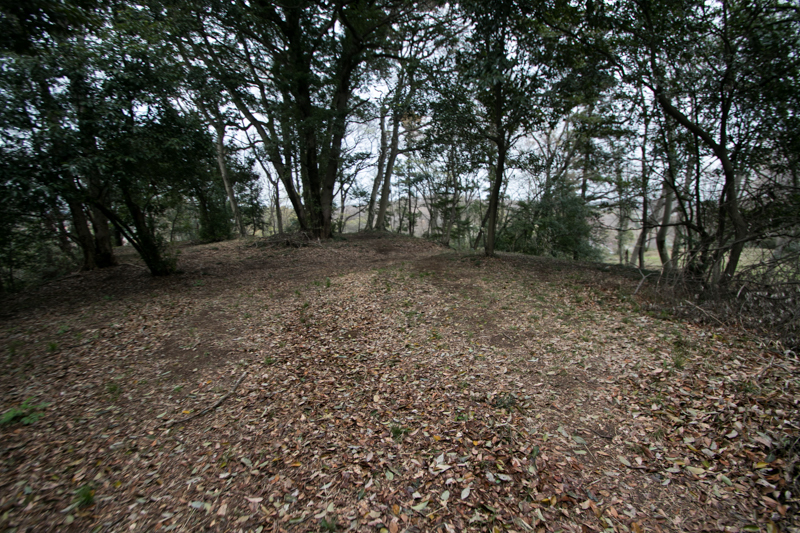 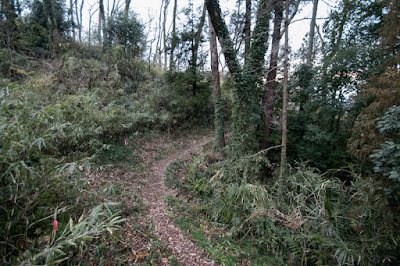 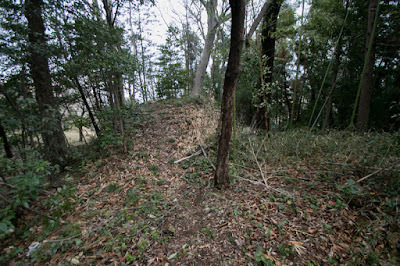 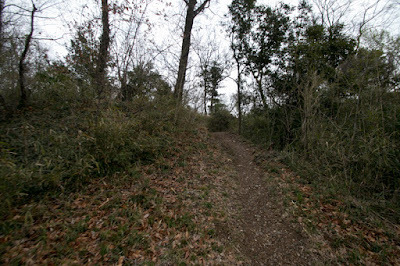 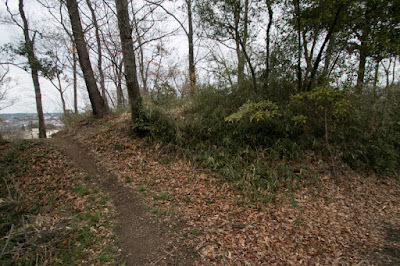 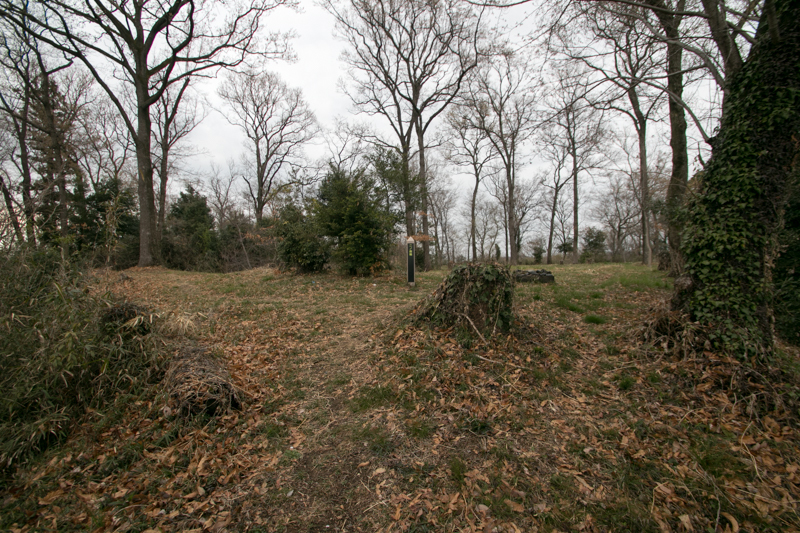 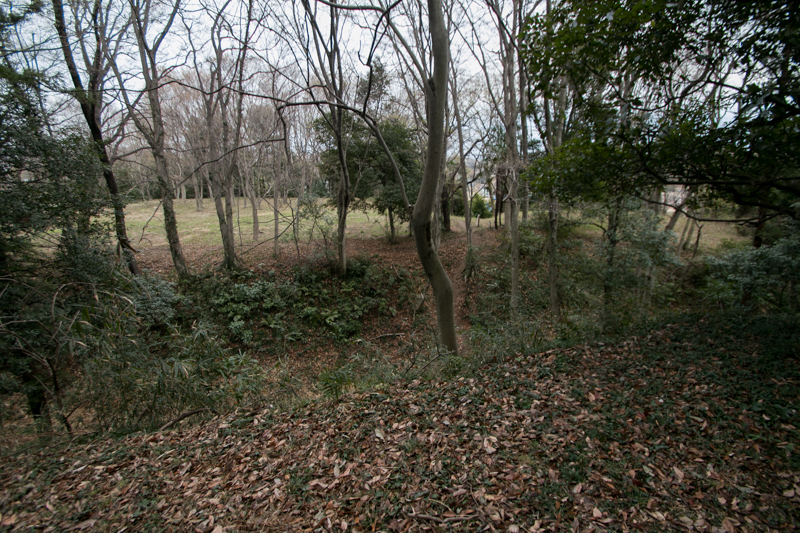 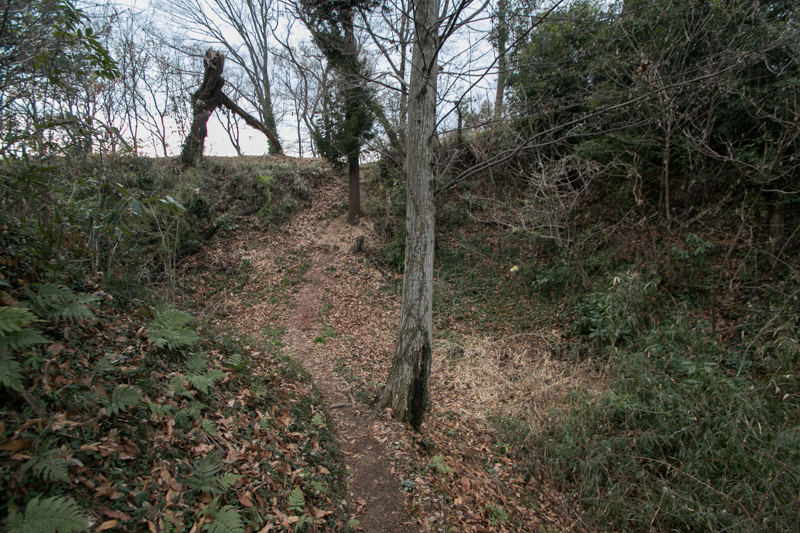 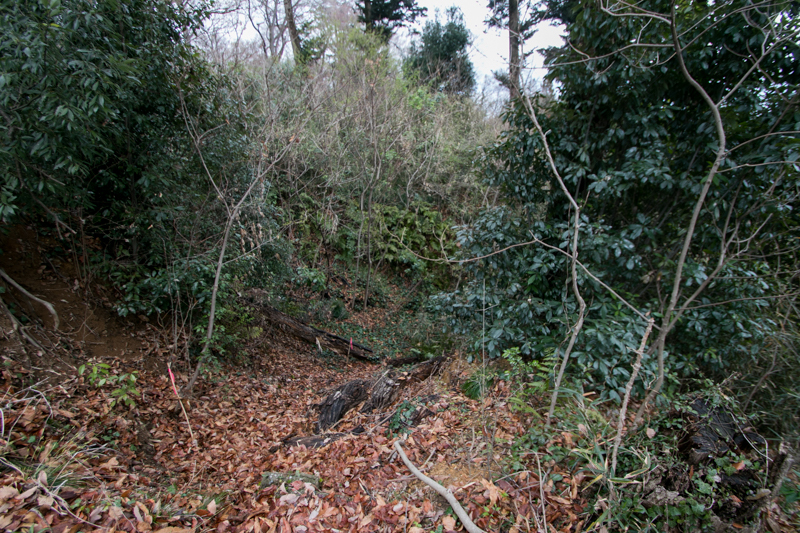 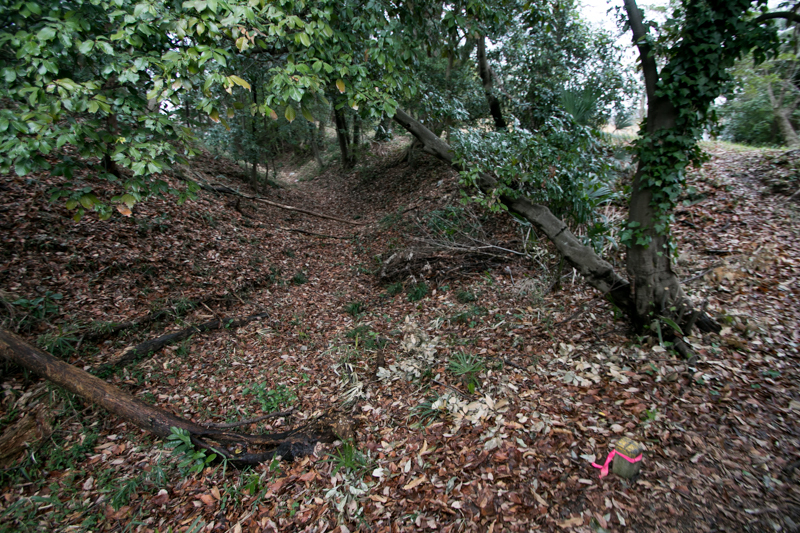 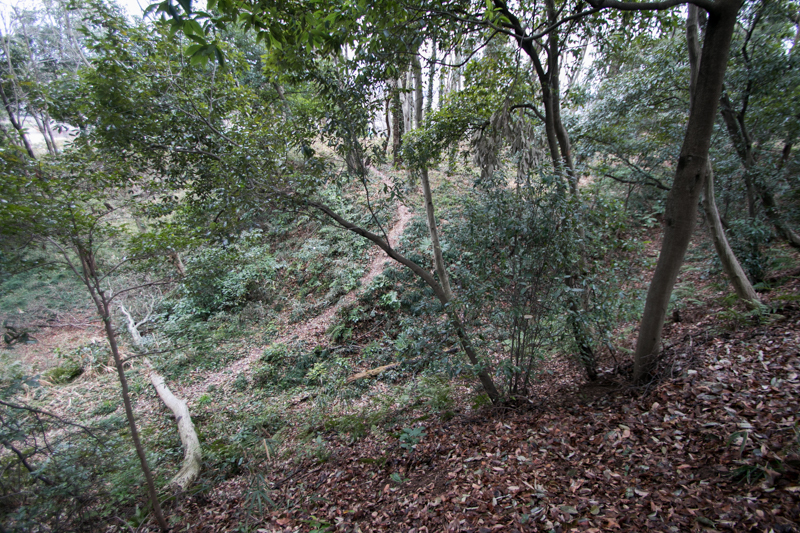 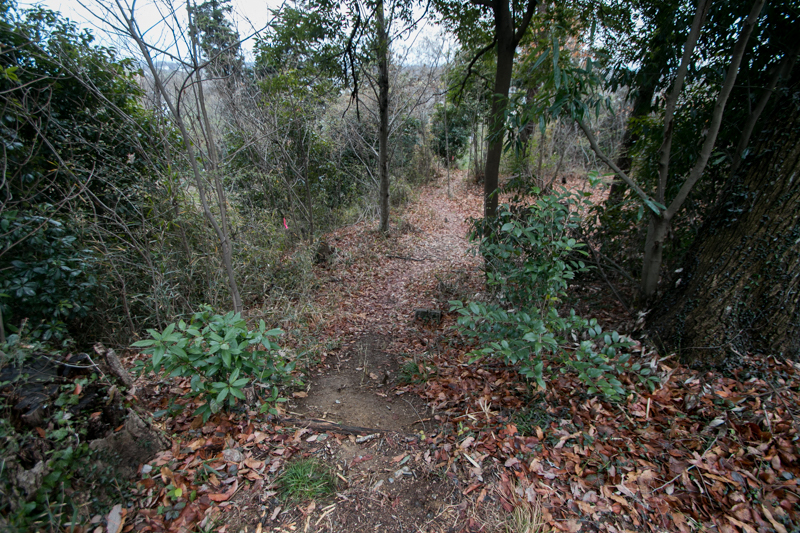 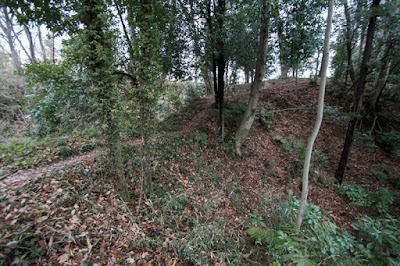 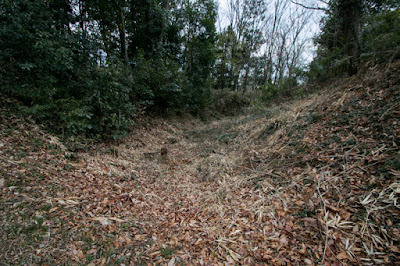 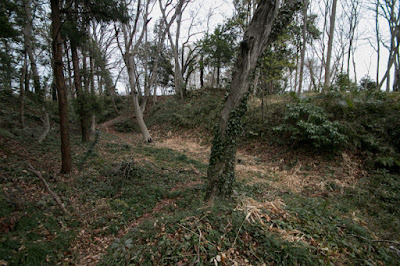 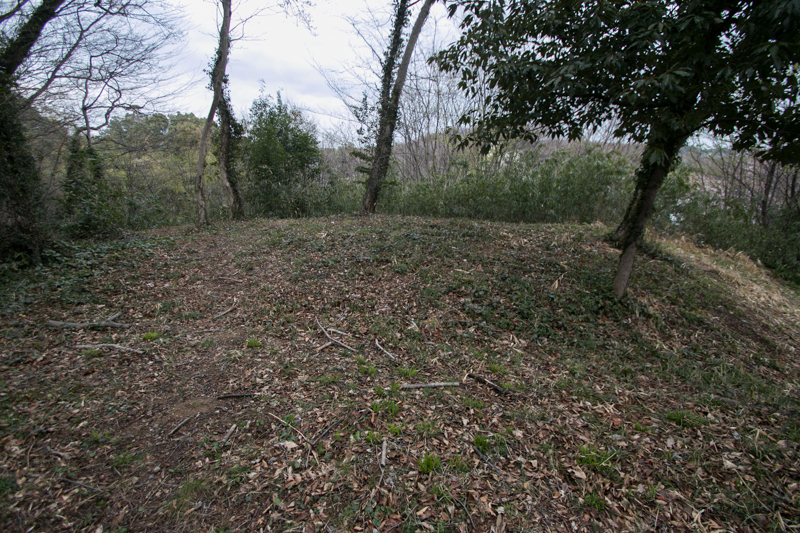 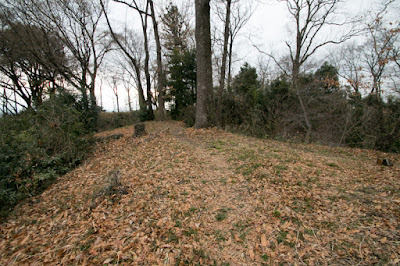 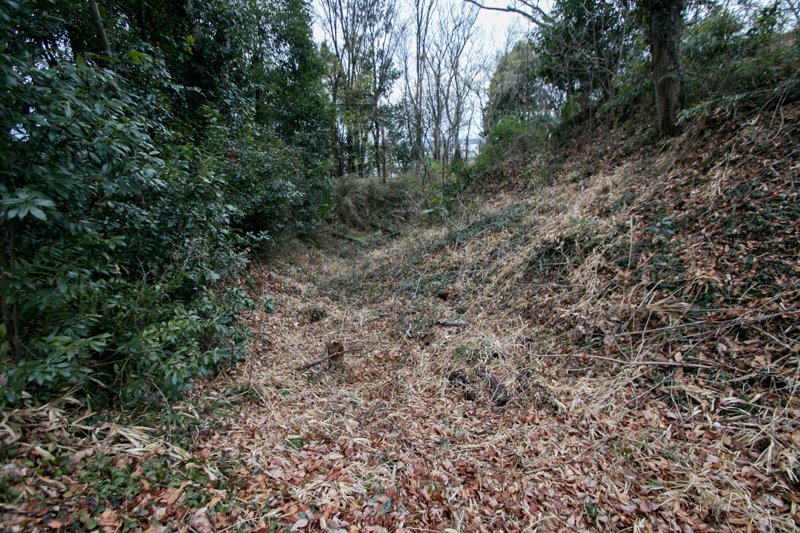 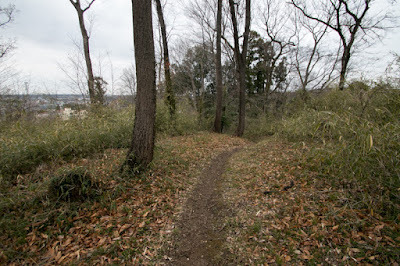 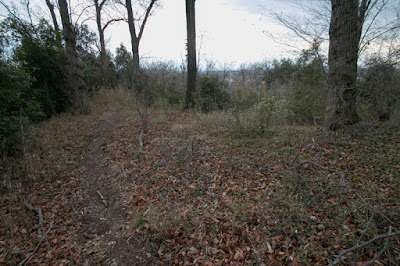 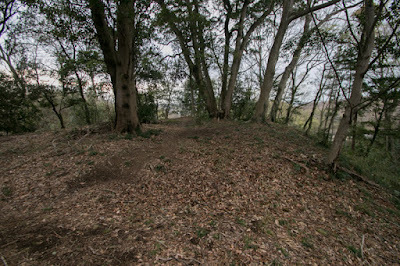 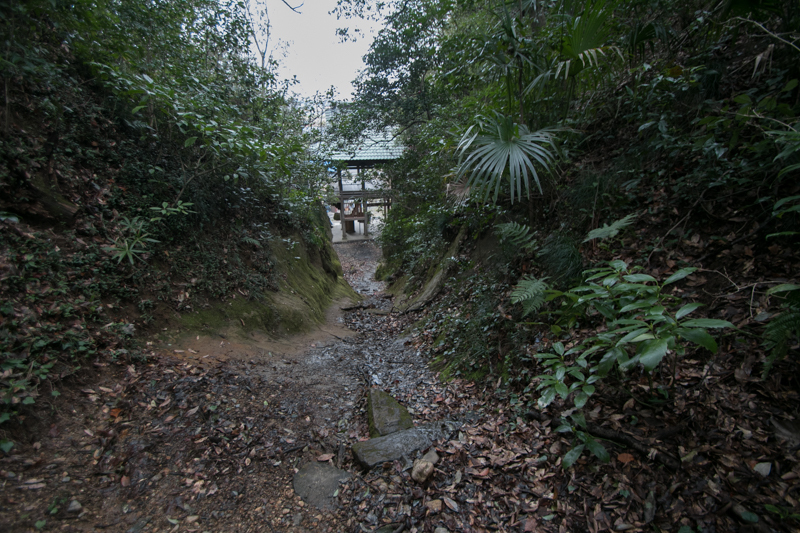 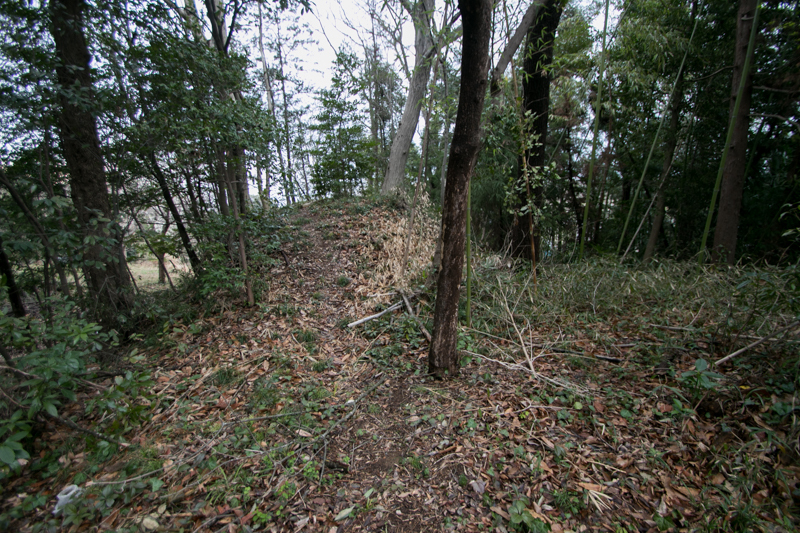 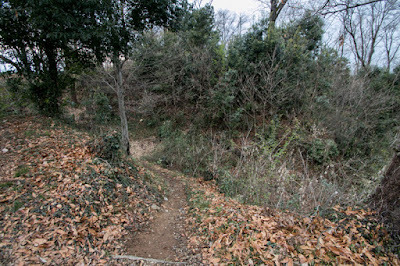 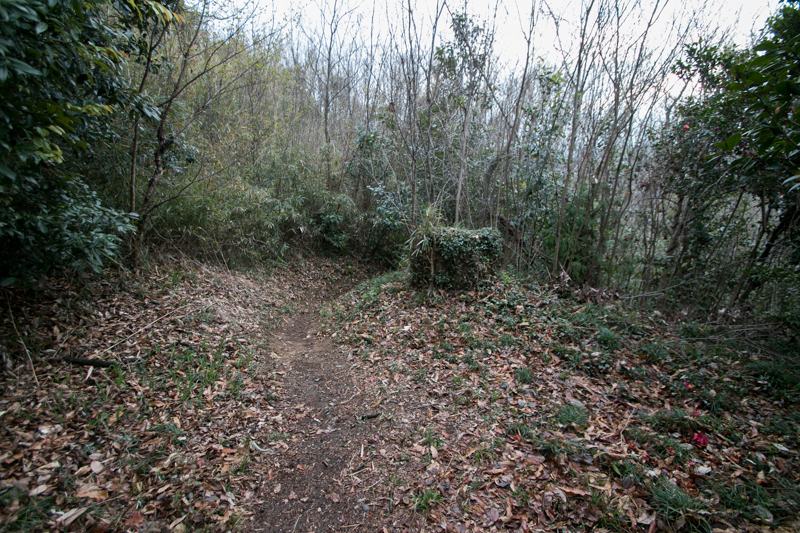 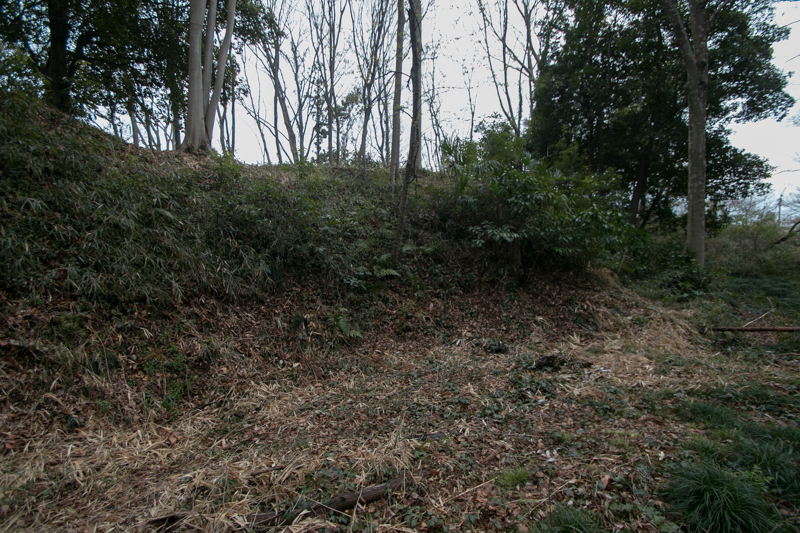 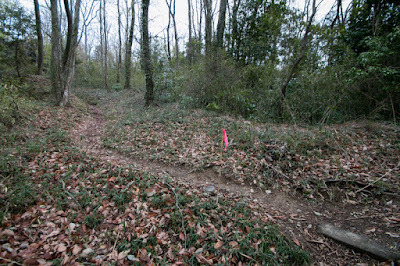 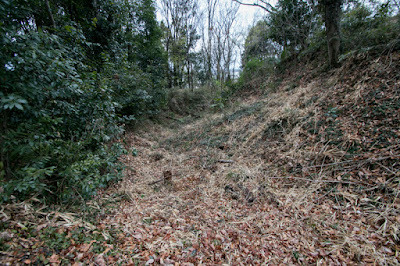 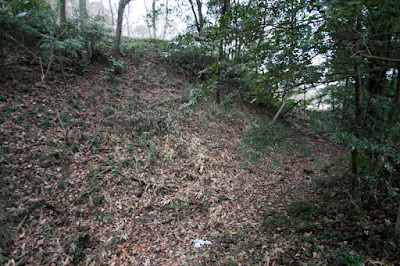 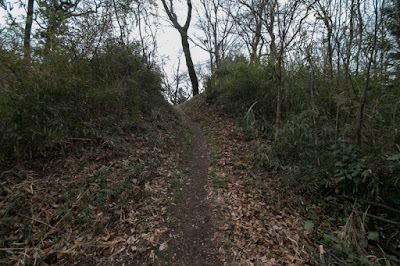 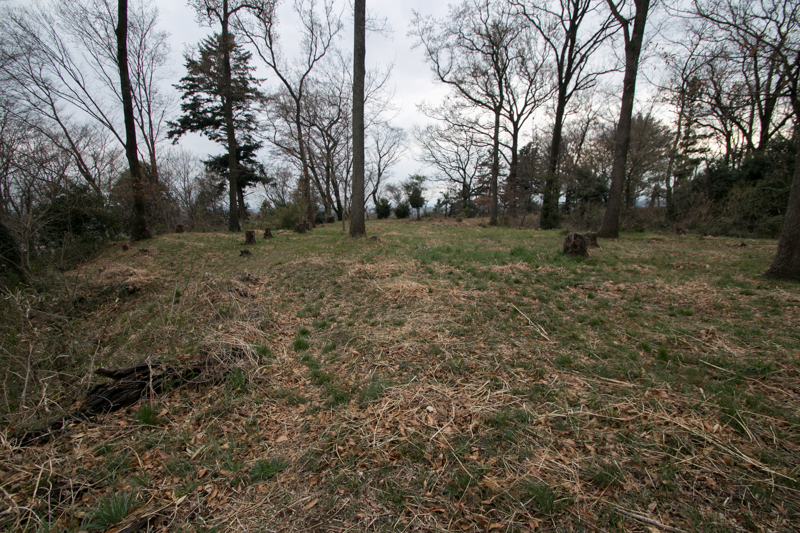 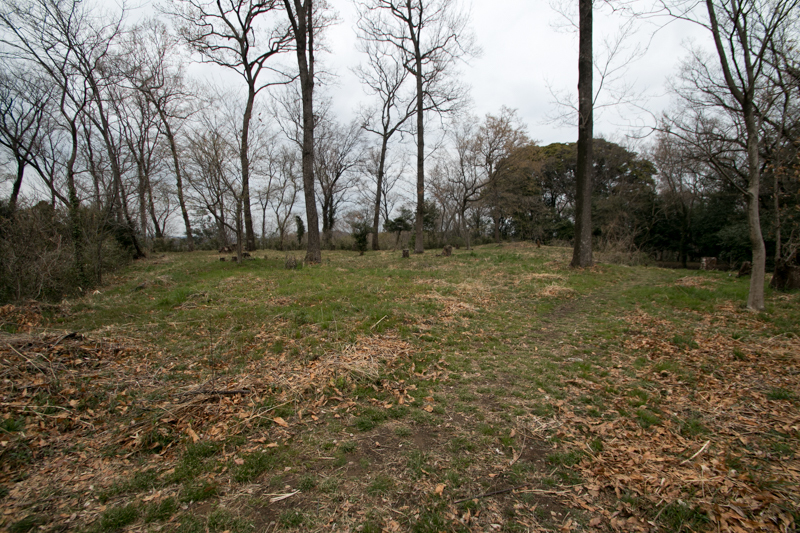 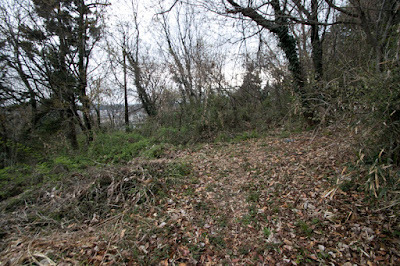 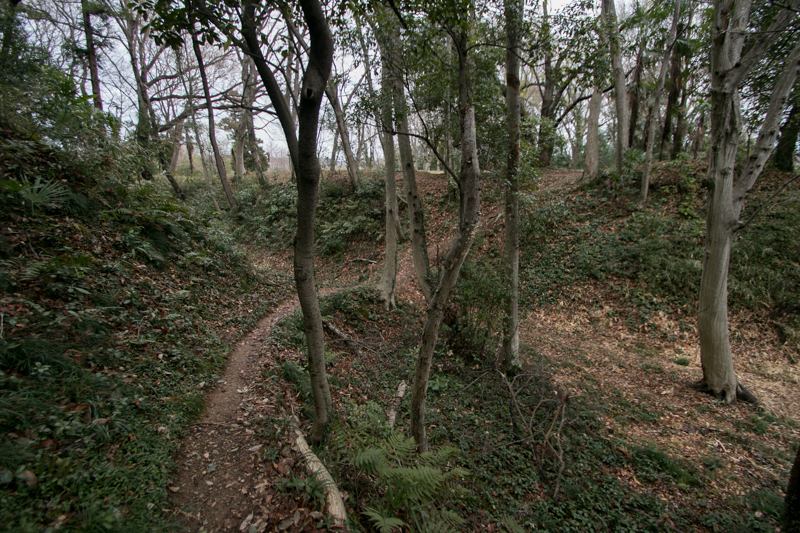 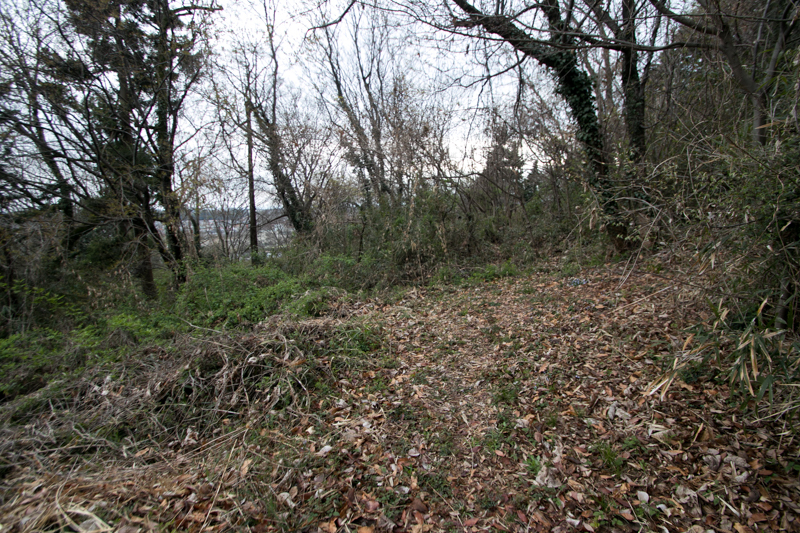 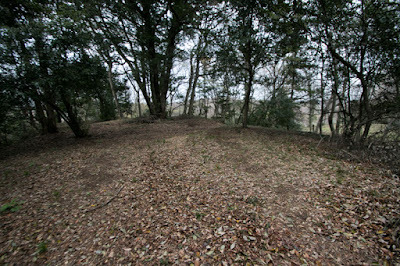 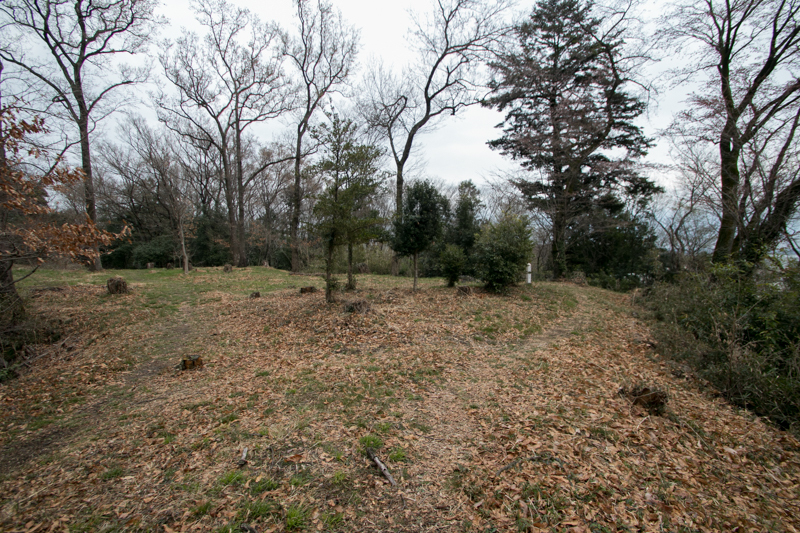 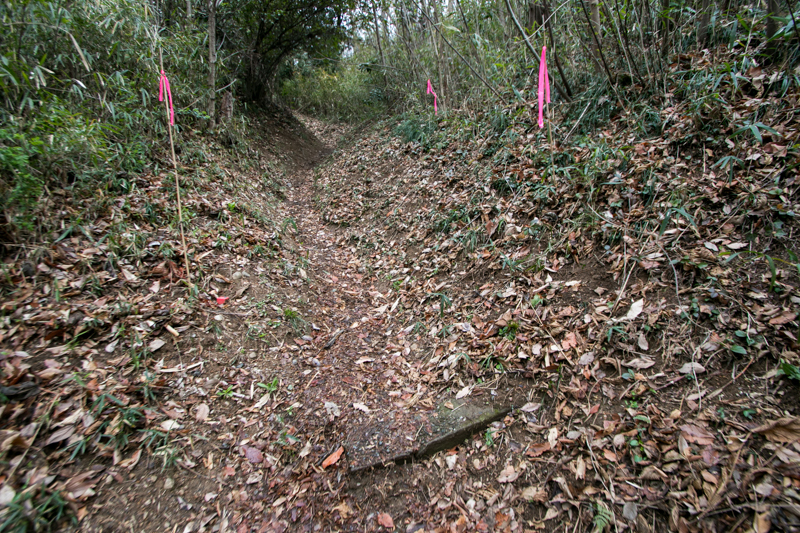 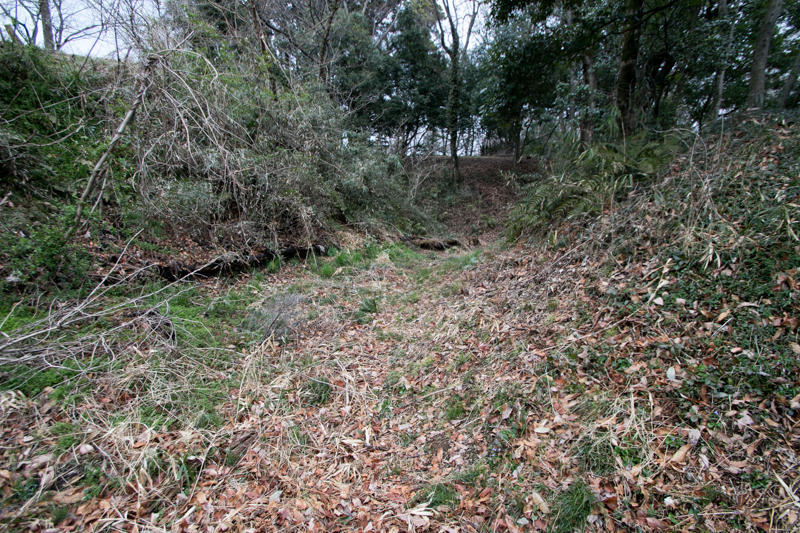 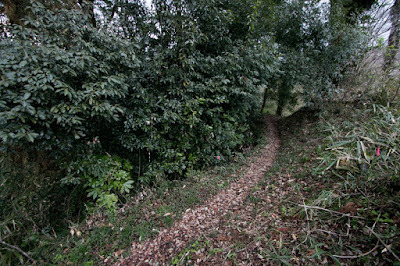 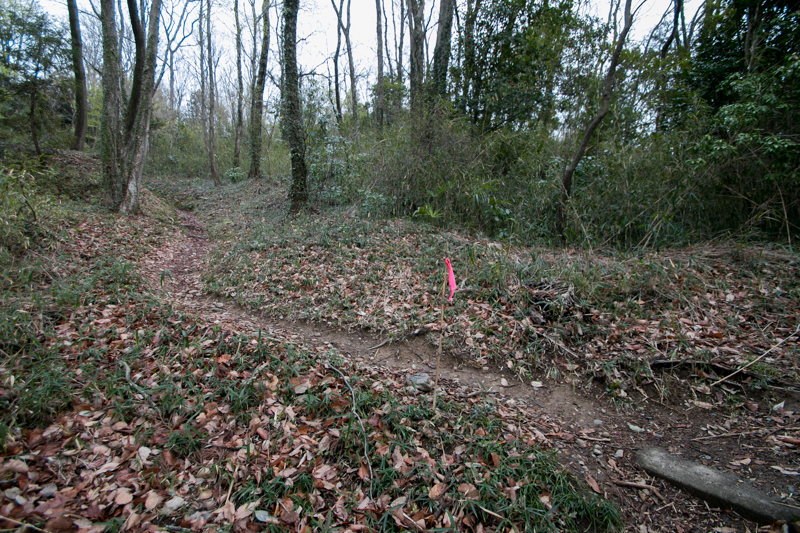 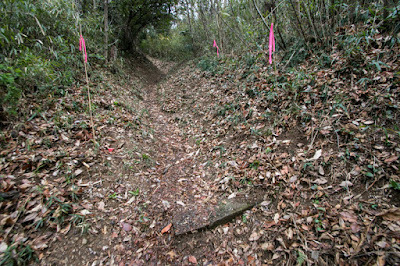 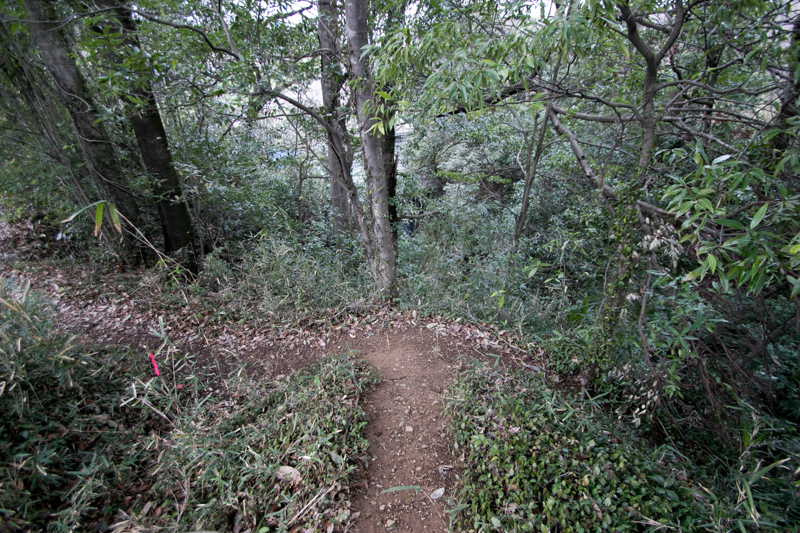 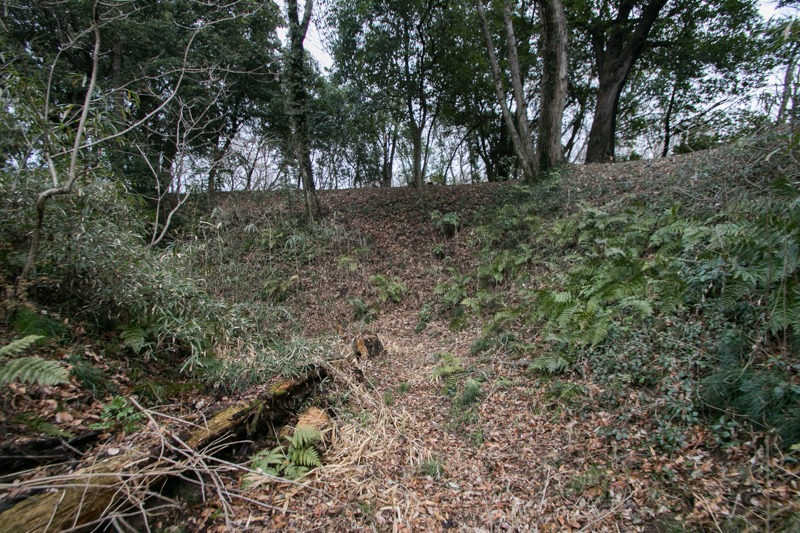 These moats were made utilizing terrain of the hill, and even though not so wide but deep and winding, then effectively obstructed attackers movement. 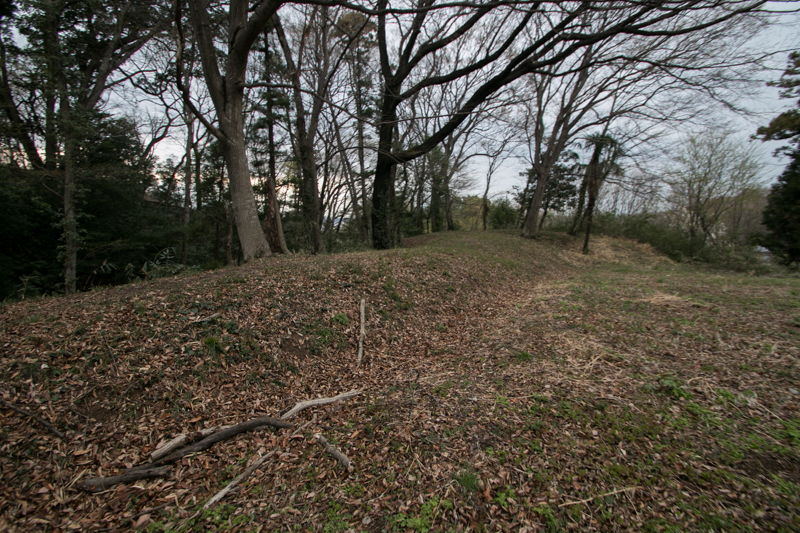 The defense line of this castle was technically advanced one assuming close combat, prior to spread of match rock rifles. 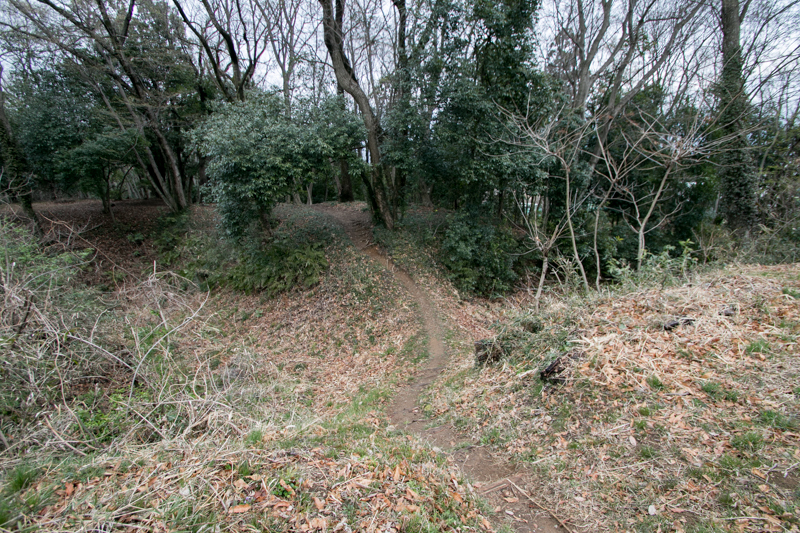 Utilizing this castle Ogigayatsu Uesugi clan stand the attack of Hojo clan nearly 10 years, but in 1546 anti Hojo alliance including Ogigayatsu Uesugi clan suffered severe defeat by Ujiyasu Hojo (1515-1571), third leader of Hojo clan, at the night battle of Kawagoe castle. 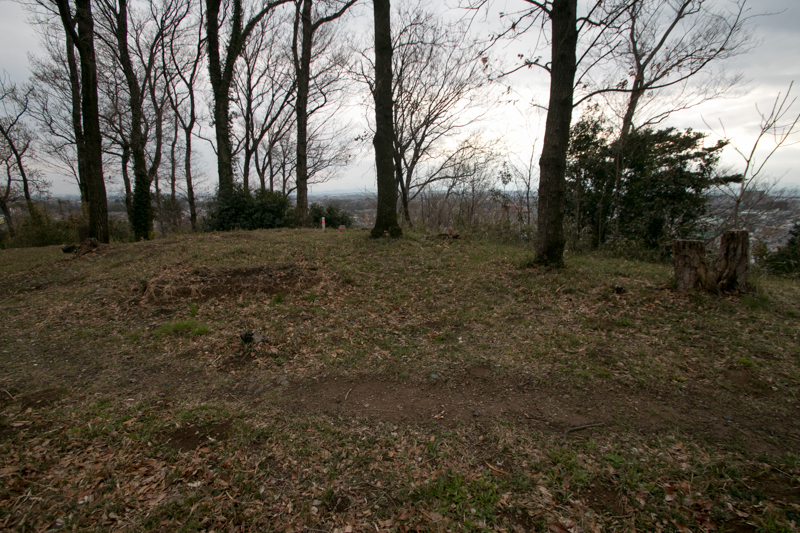 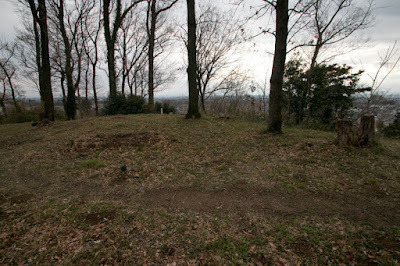 Both Tomosada and Norishige died in the battle, and Matsuyama castle was captured by Hojo clan at this time. In 1560, Kenshin Uesugi (1530-1578), a warlord of Echigo province (Niigata prefecture) and succeeded Kanto Kanrei (general governor) position from Norimasa Uesugi (1523-1579), who was also defeated at night battle of Kawagoe and ran away to Echigo, made a large expedition to Kanto region. 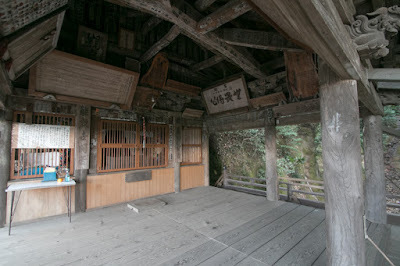 Kenshin rapidly gathered local lords and advanced into Hojyo territory. 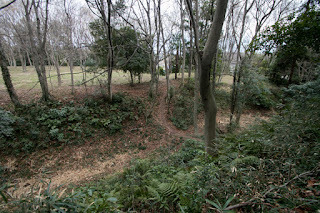 Musashi Matsuyama castle was seized by Kenshin at this time, and Kenshin let Sukemasa Ota (1522-1591), a talented general and commander of Iwatsuki castle, to guard Matsuyama castle. 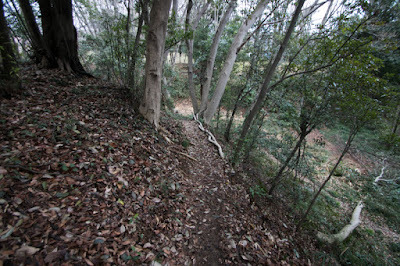 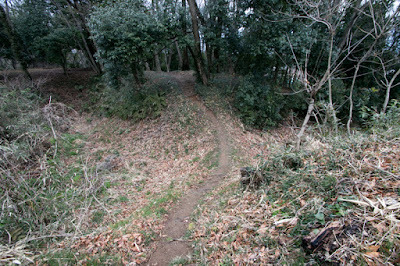 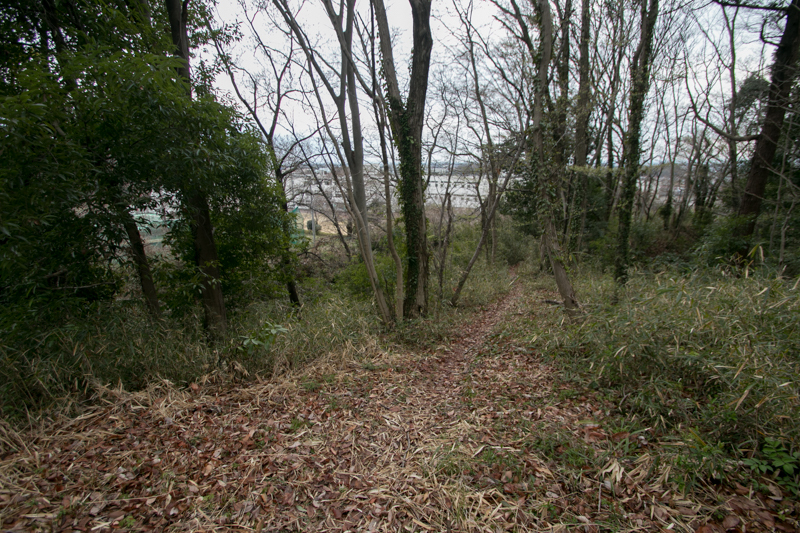 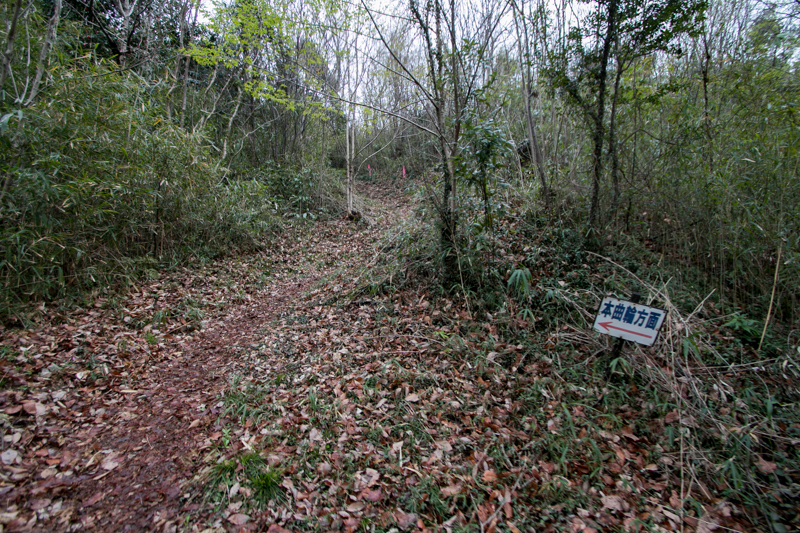 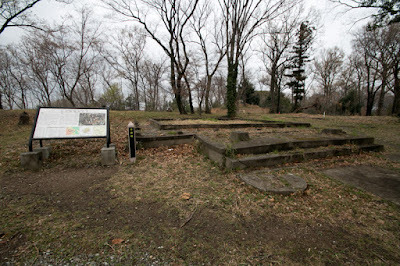 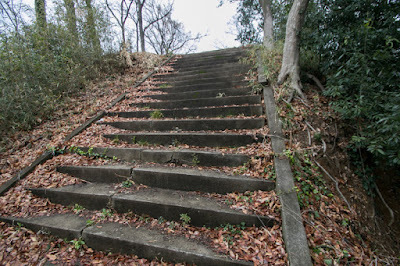 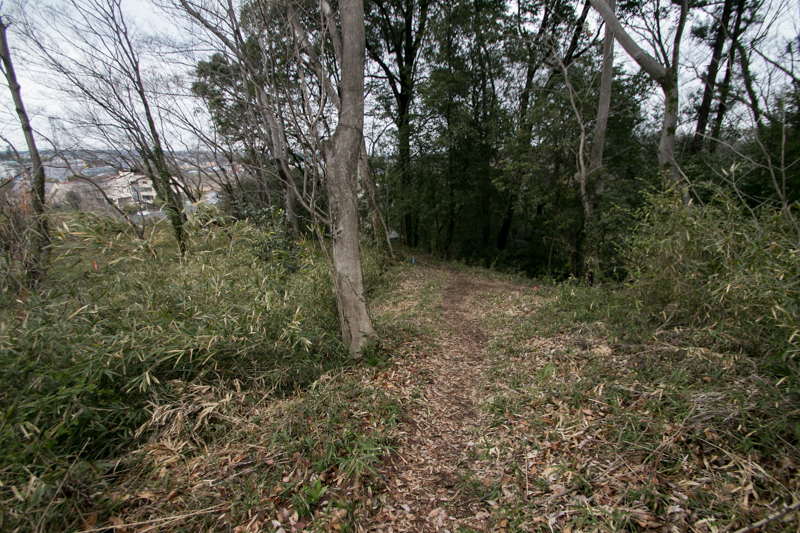 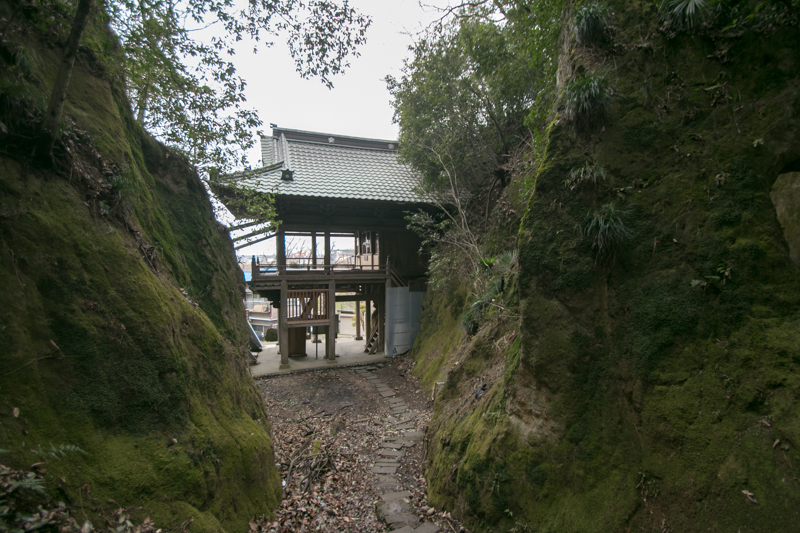 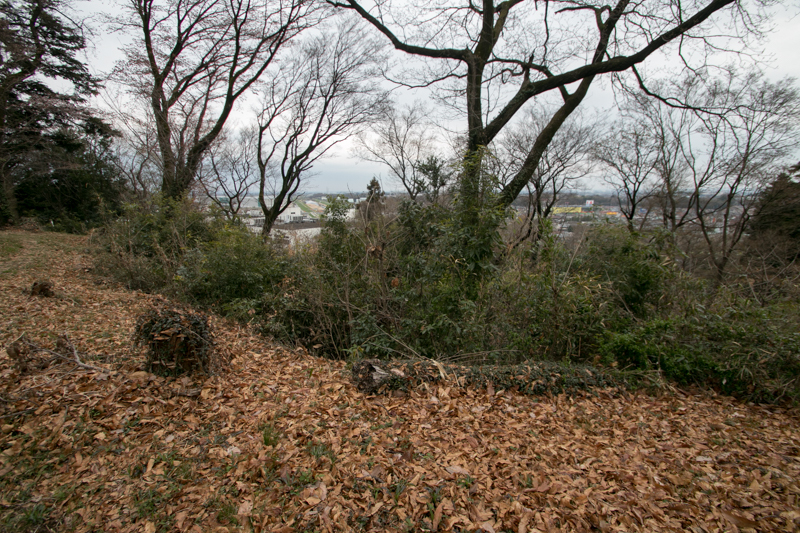 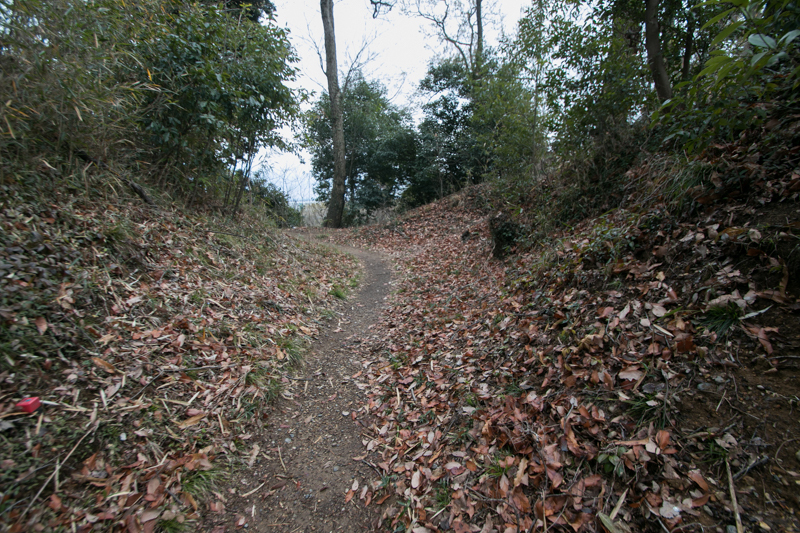 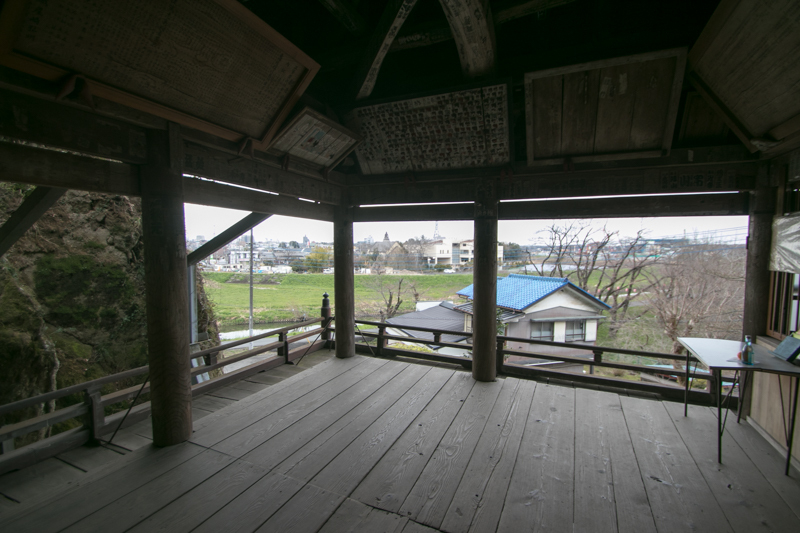 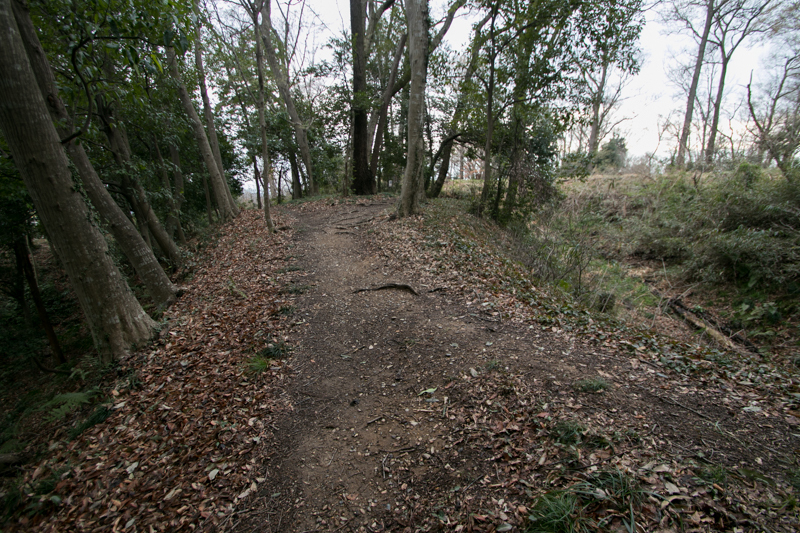 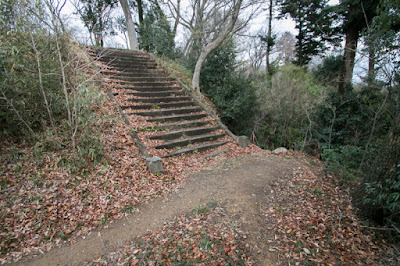 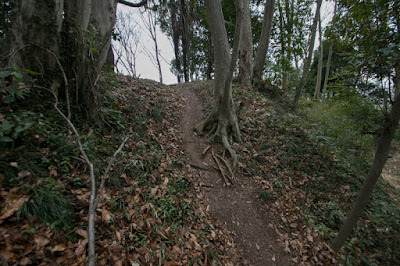 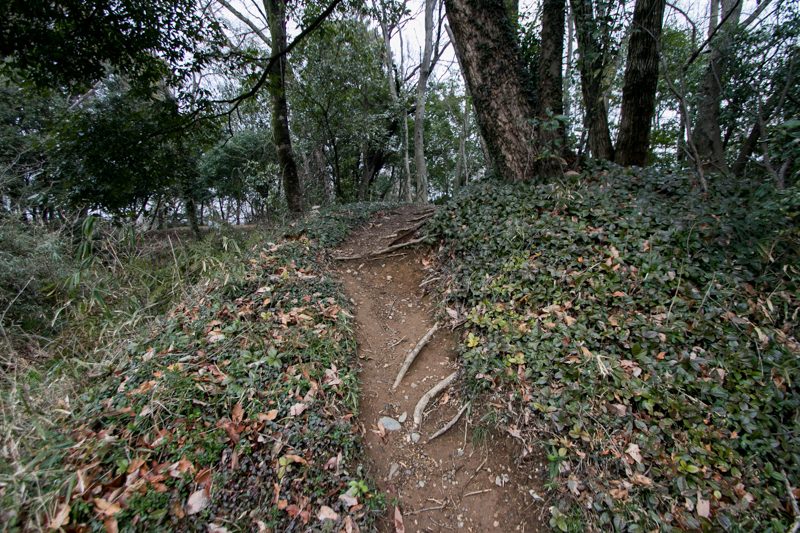 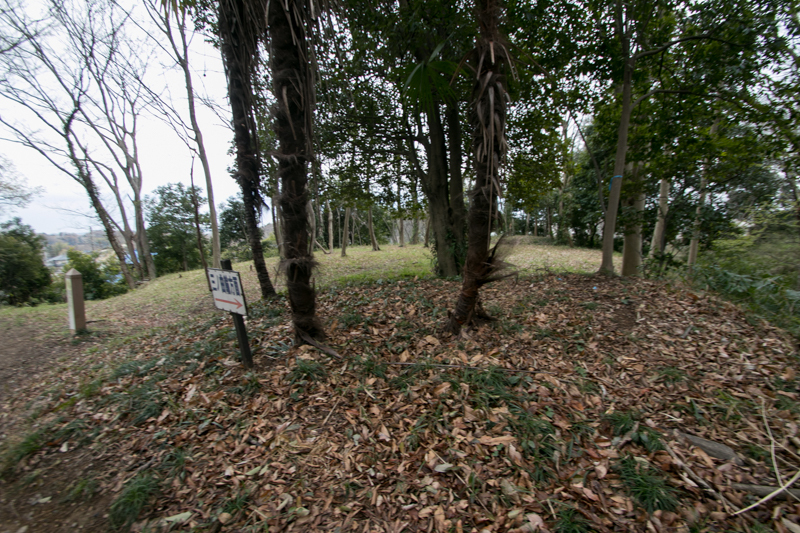 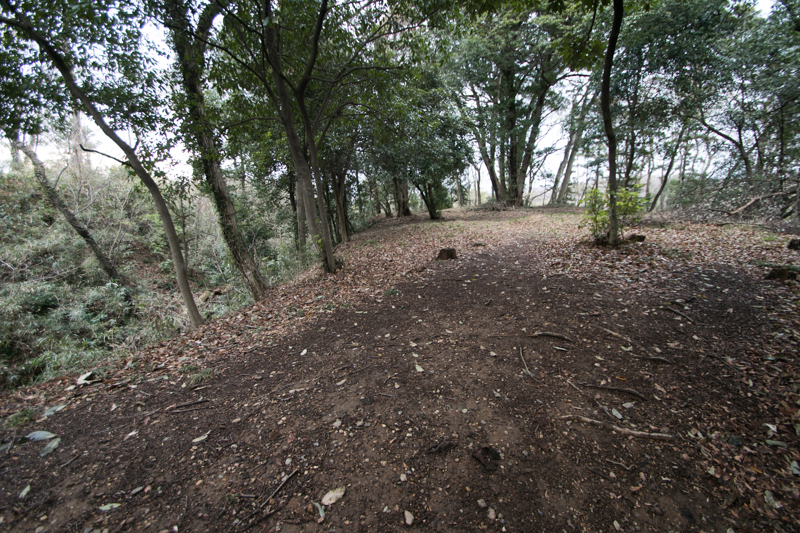 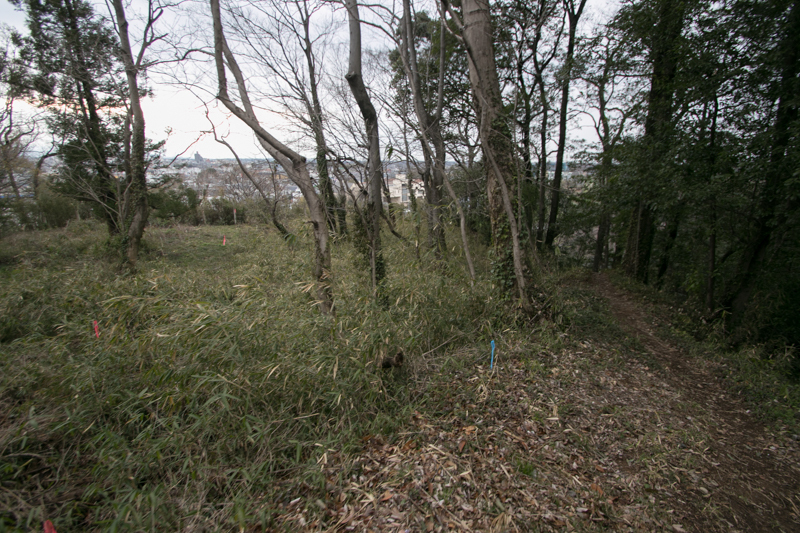 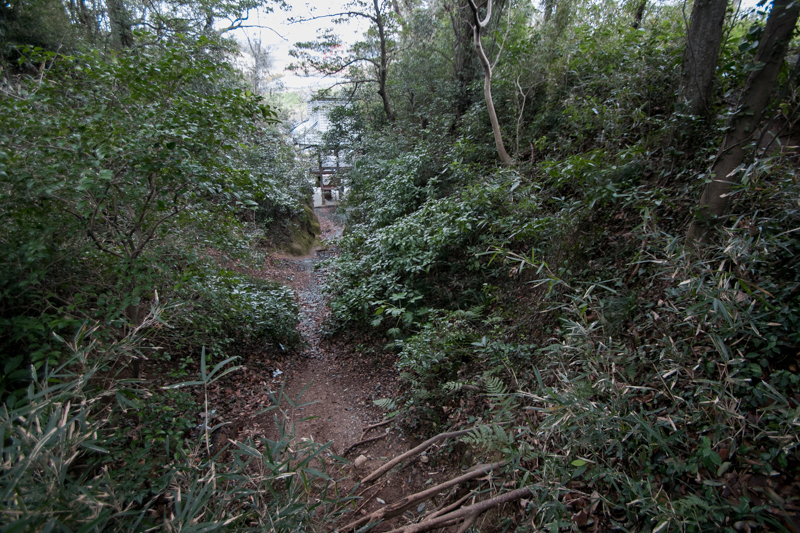 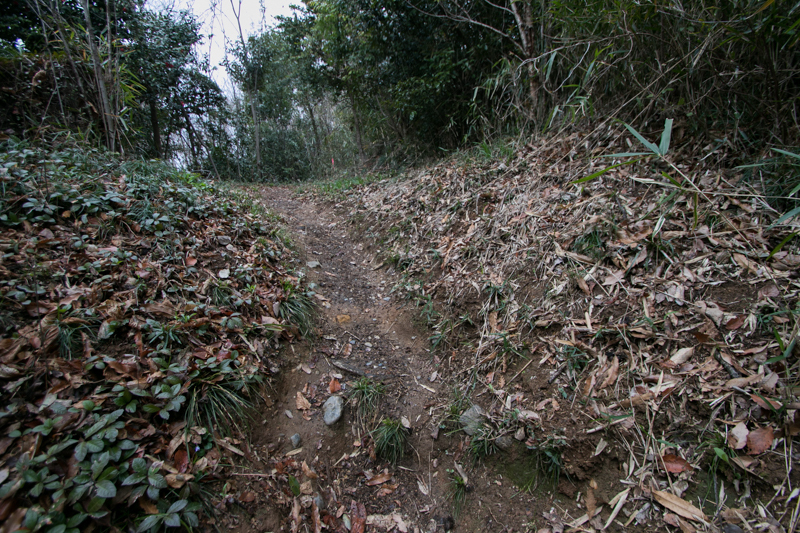 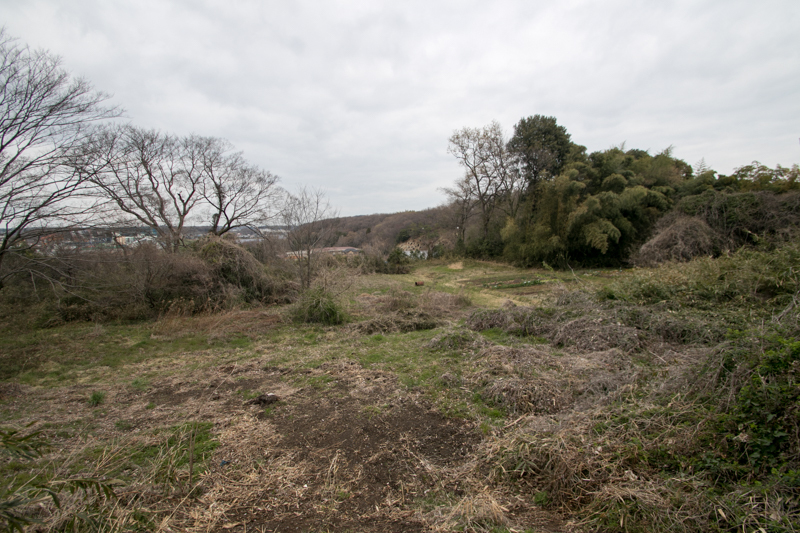 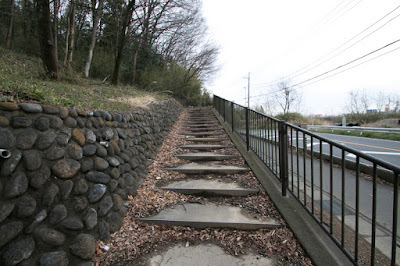 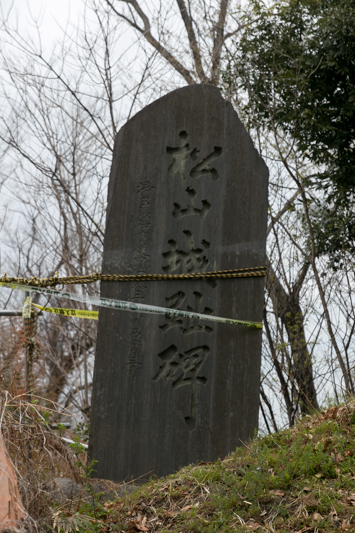 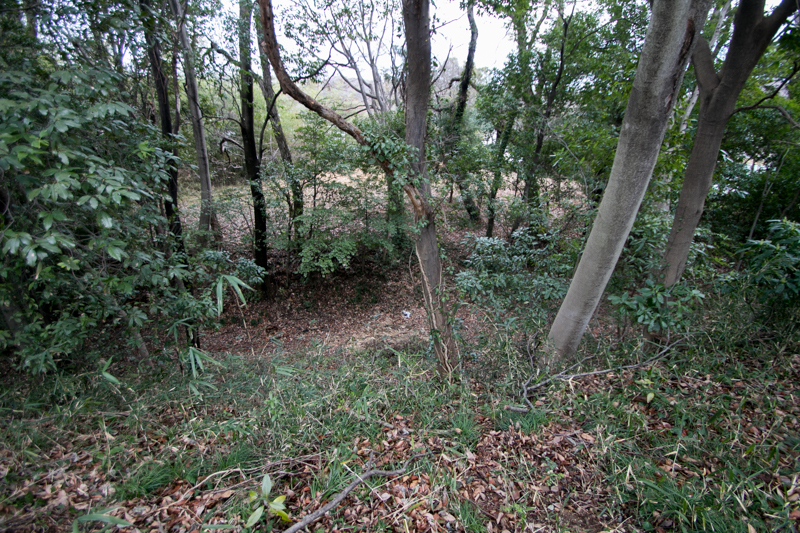 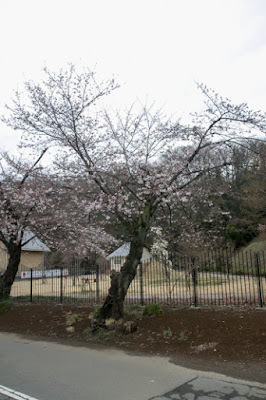 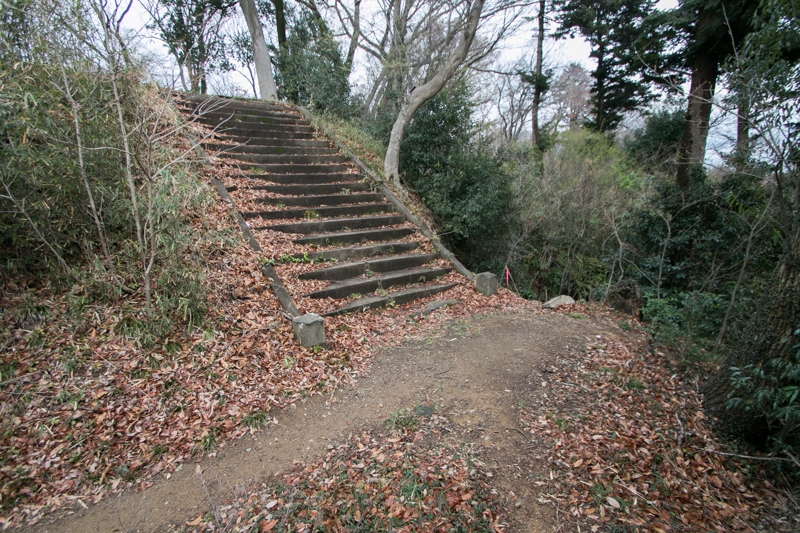 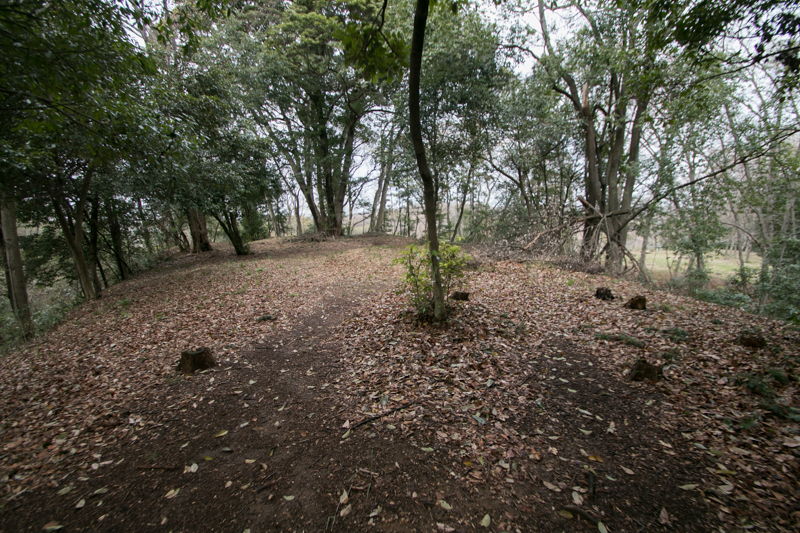 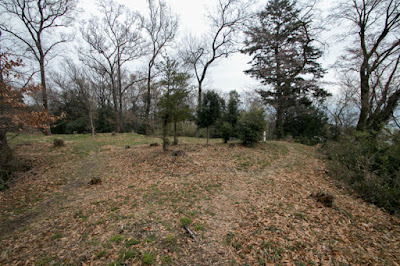 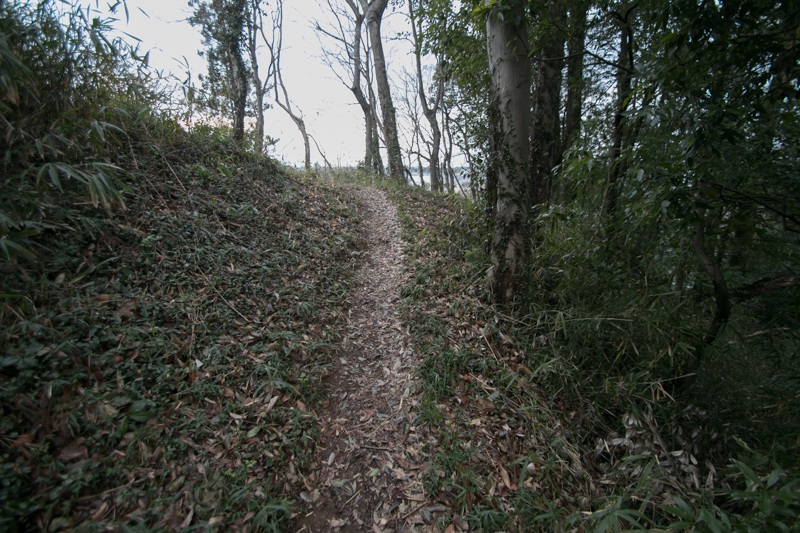 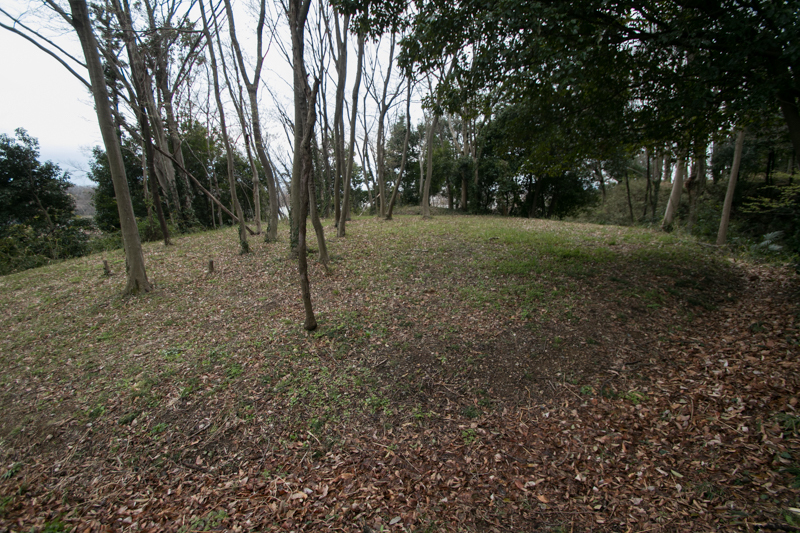 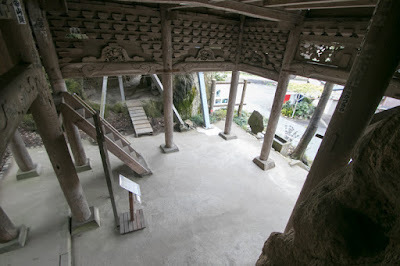 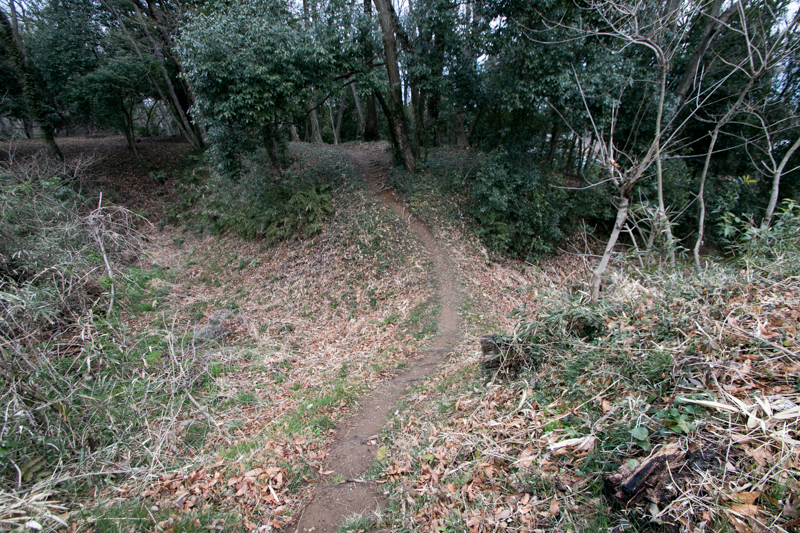 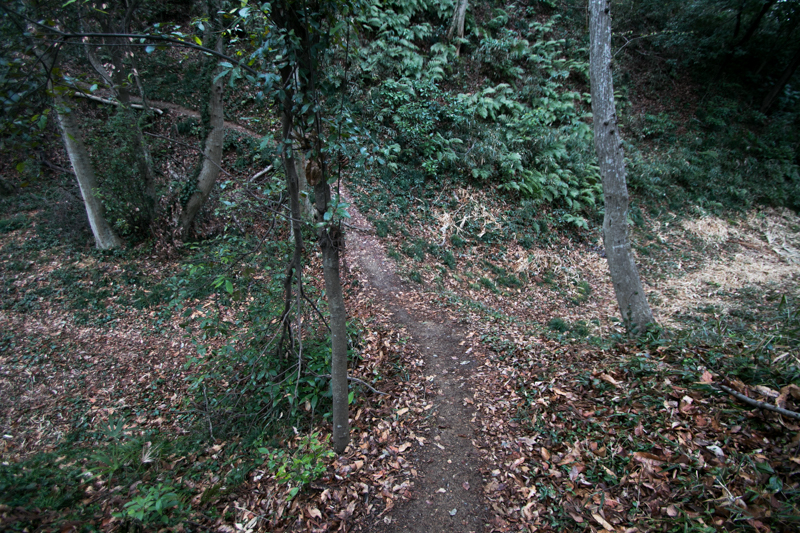 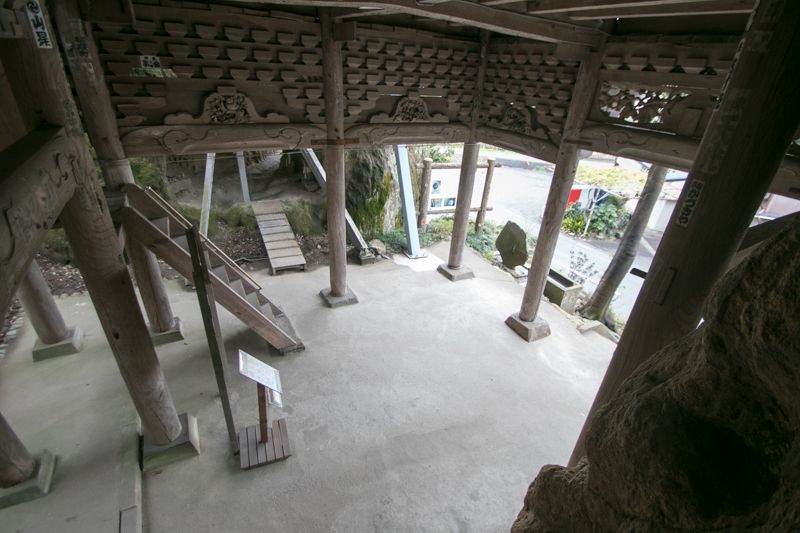 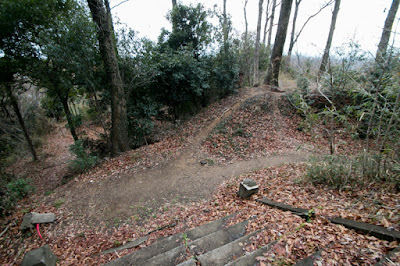 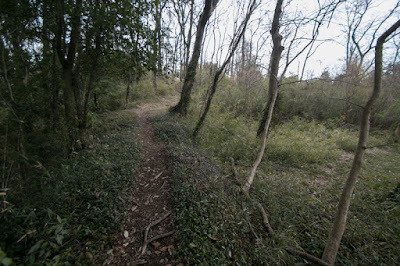 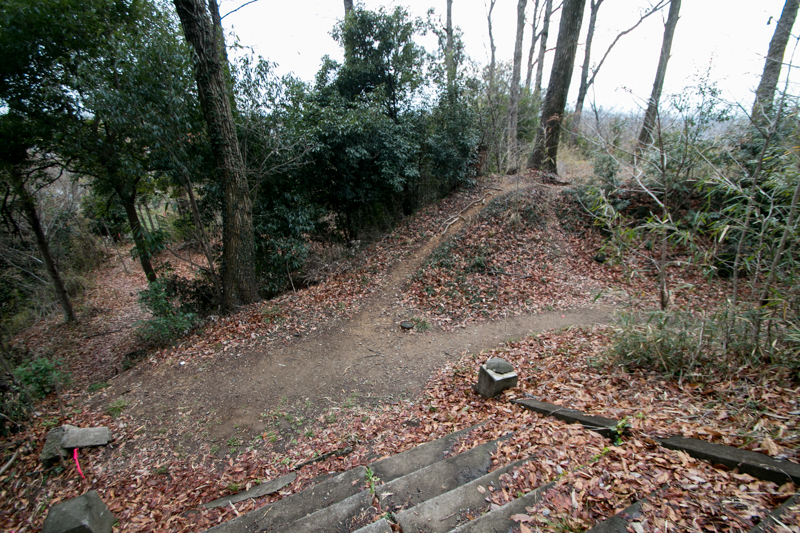 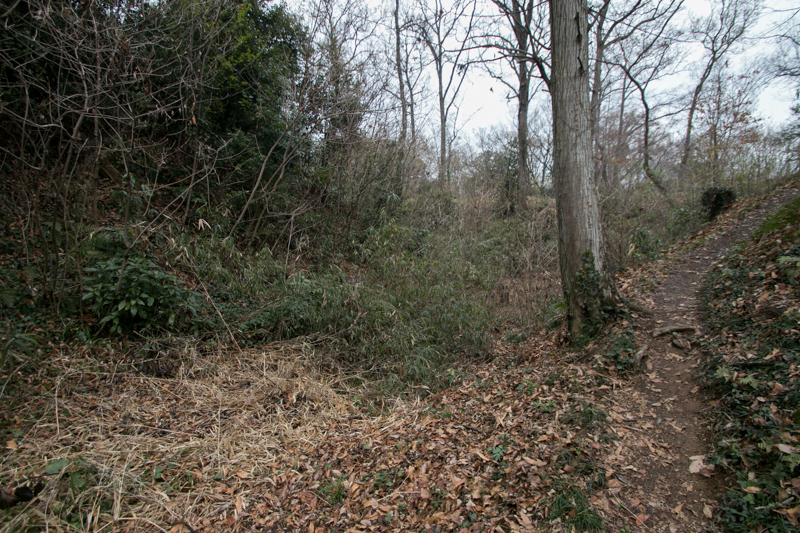 Soon after that Kenshin siege Odawara castle (Kanagawa prefecture), the main base of Hojyo clan, but could not fall it and returned to Echigo province. 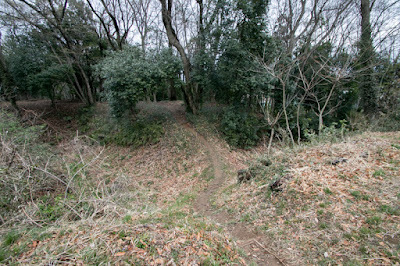 Just after the return of Kenshin, counter attack of Hojyo clan began. 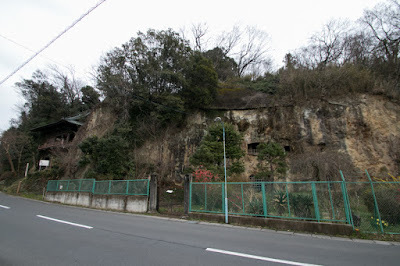 In 1561 Ujiyasu Hojyo and Shingen Takeda (1521-1573), a warlord of Kai province (Yamanashi prefecture) and an ally of Ujiyasu, immediately attacked Musashi Matsuyama castle. As Matsuyama castle was further strengthened and well prepared for the battle, Ujiyasu and Shingen could not easily fall it. 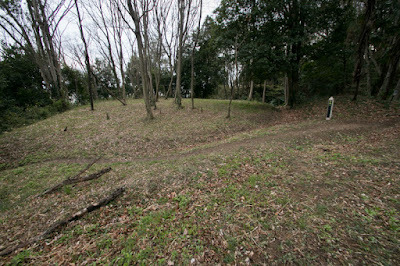 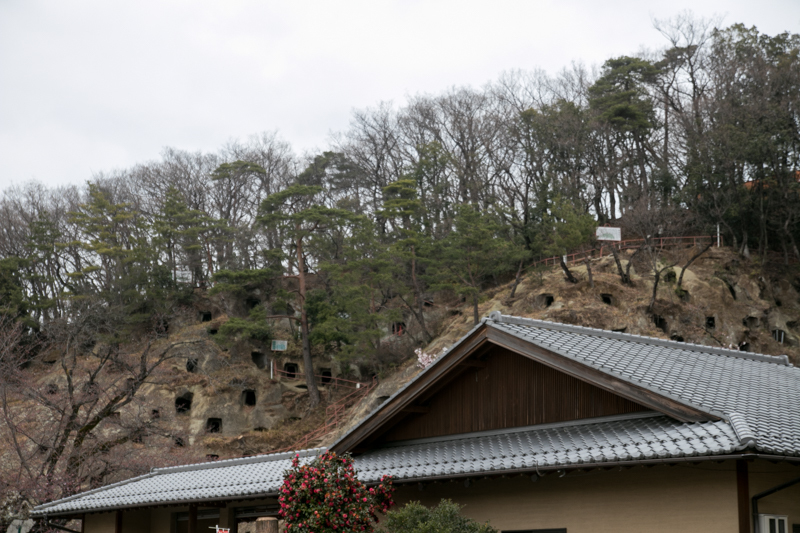 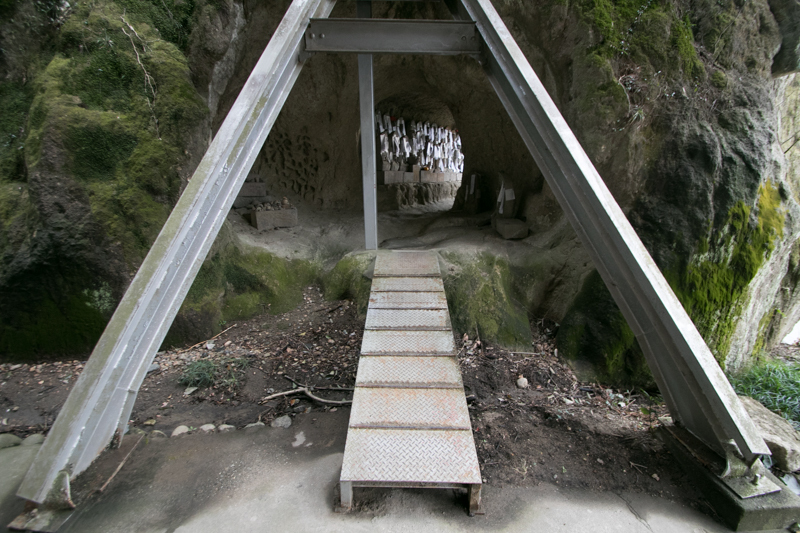 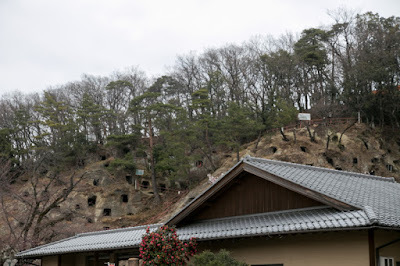 Shingen brought their mine workers to dig a gallery to the hill and break the structure, but this attempt also failed. 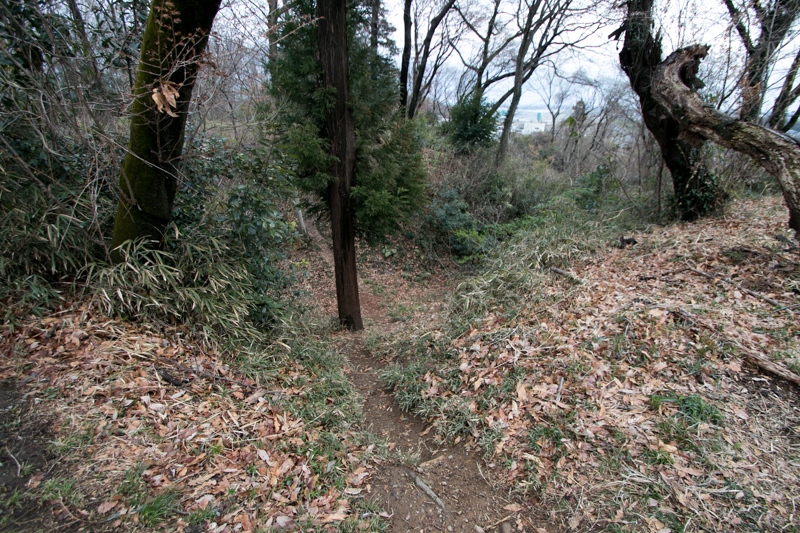 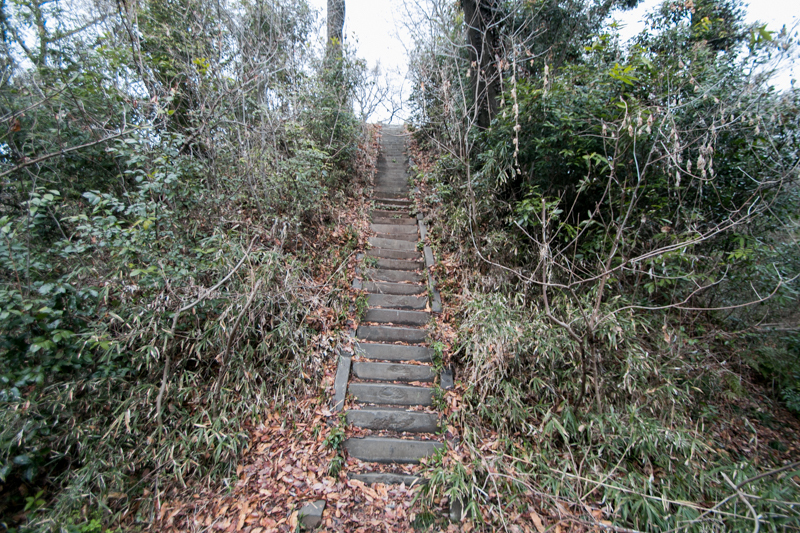 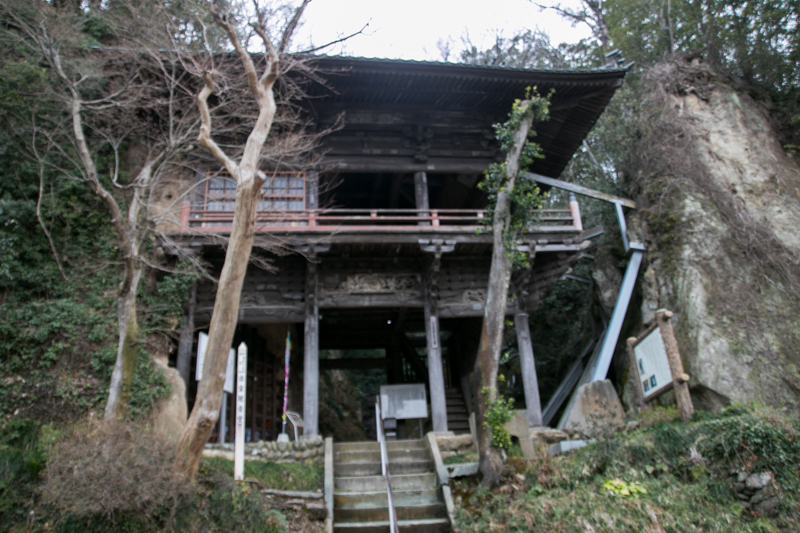 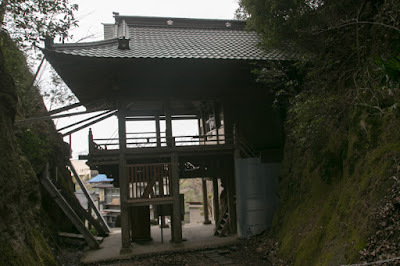 After three month deadlock Ujiyasu tricked the guardian that Kenshin could not easily rescue the castle because he had to overcome snowy mountains to reach here from their country. Hearing this, the guarding general decided to open the castle. 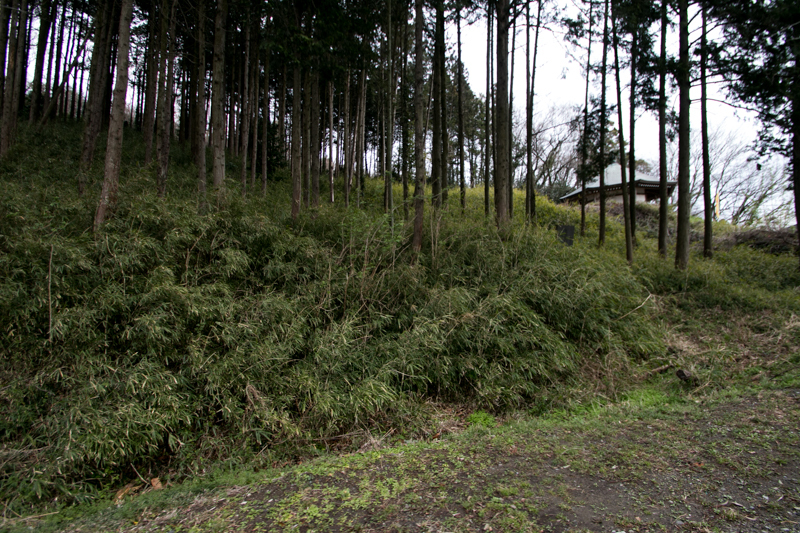 Actually at this time Kenshin already came to just beside this castle. 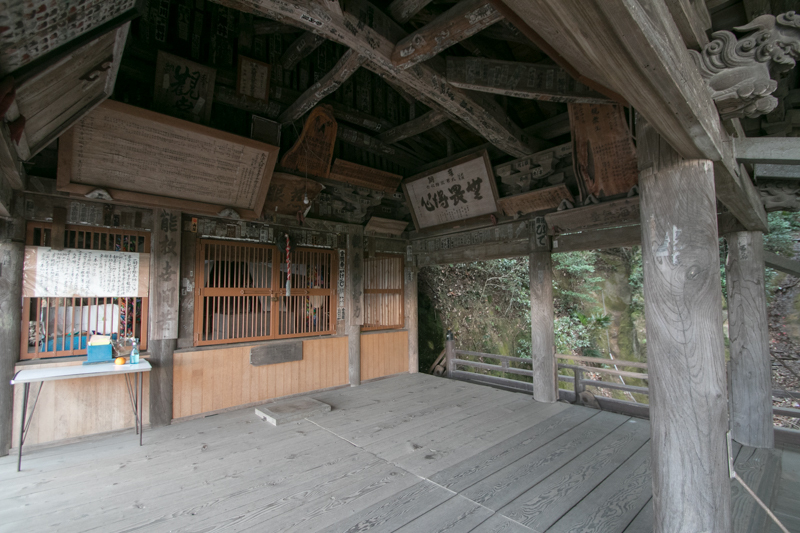 Kenshin heard the news of surrender and sent a letter to Shingen and Ujiyasu that he was ready to make a decisive battle against Takeda army and Hojo army. 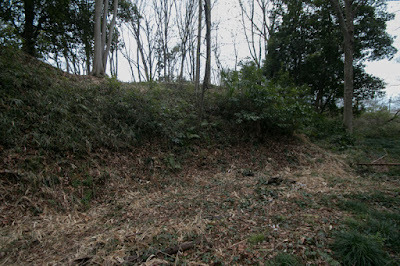 But they have already achieved their mission and did not respond to Kenshin’s challenge. 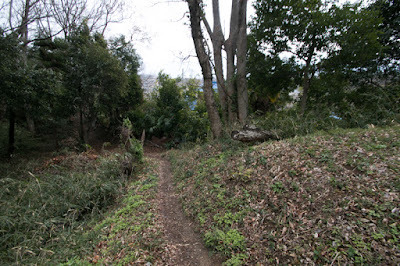 Reluctantly Kenshin attacked neighbor Hojyo side castle and fell it, and returned. 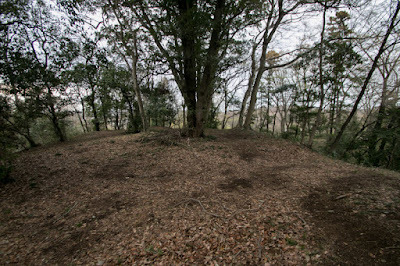 If they actually fought this might be a dramatic battle between three famous warlords, and it was unfortunate not to be so. 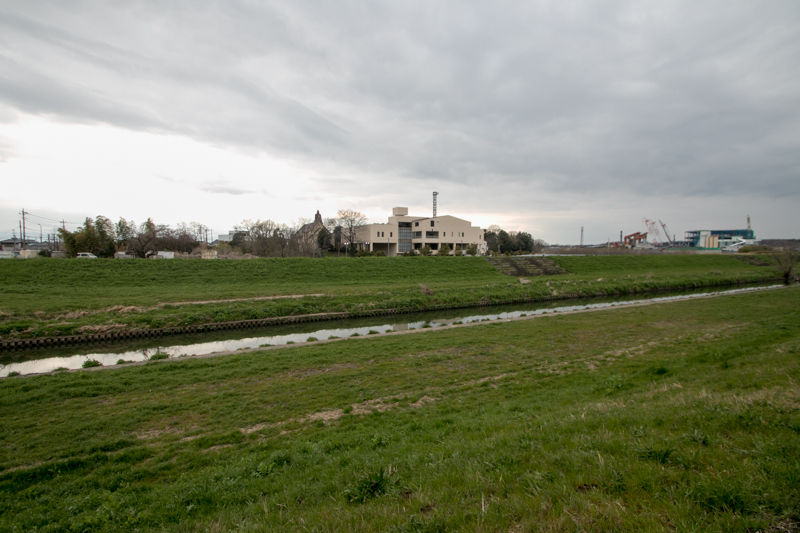 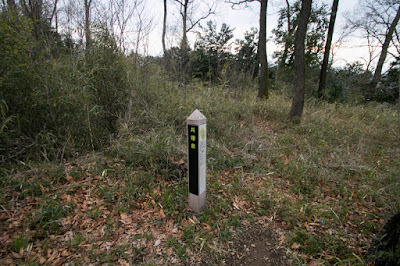 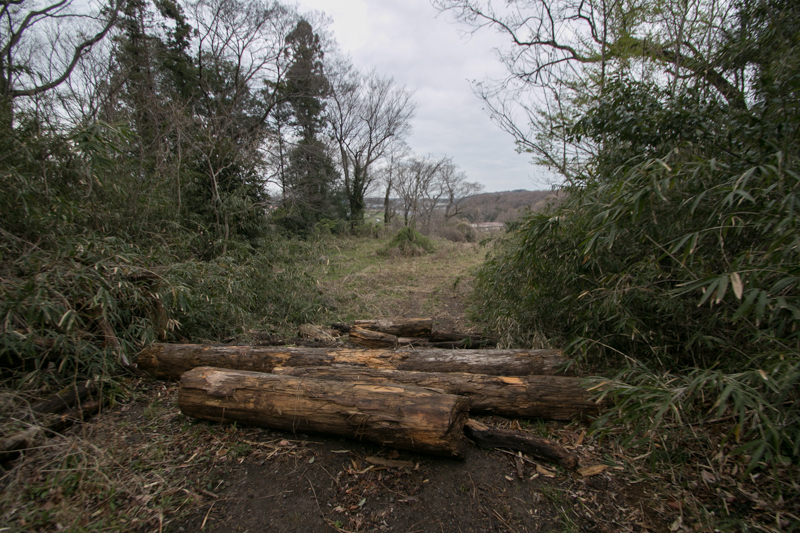 Kenshin lost foothold to left bank of Arakawa river could not endanger core territory of Hojo clan any more. 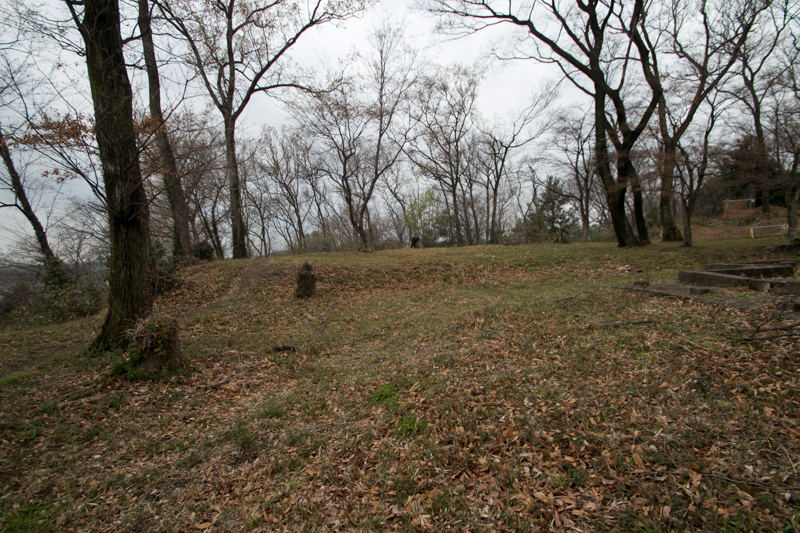 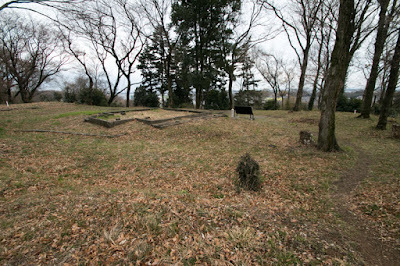 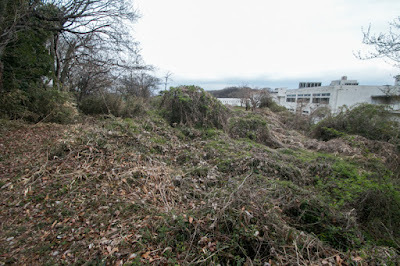 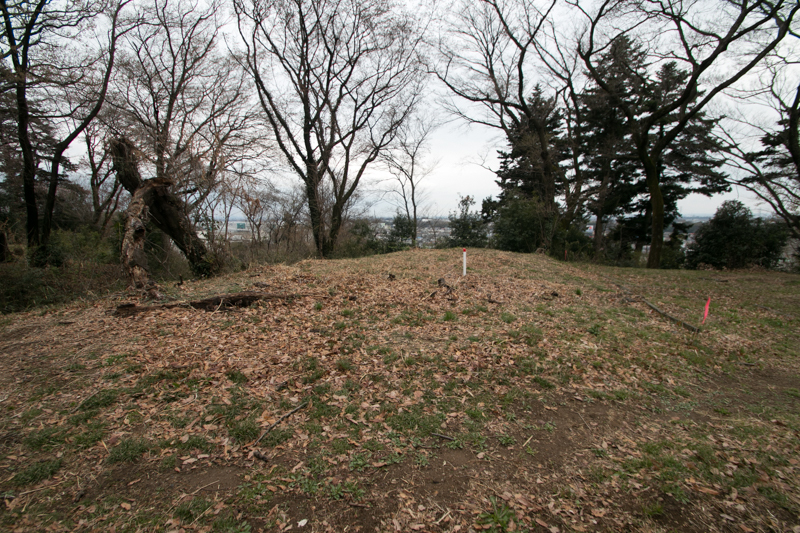 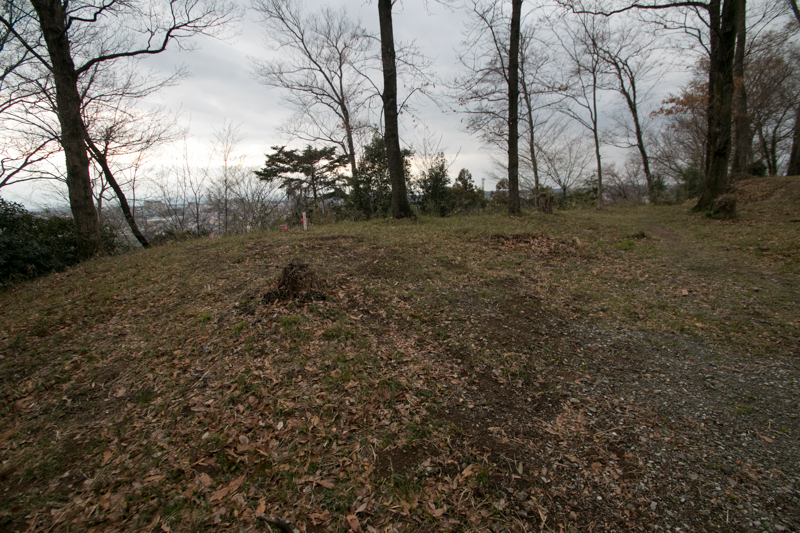 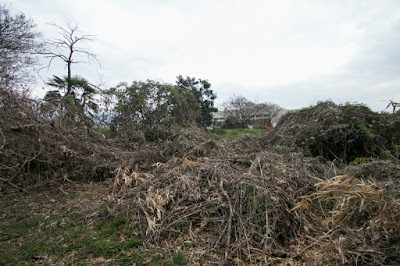 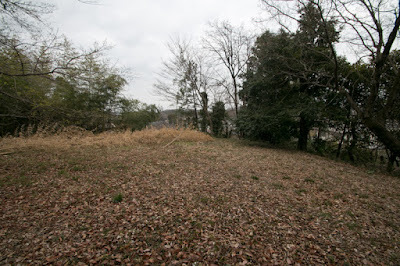 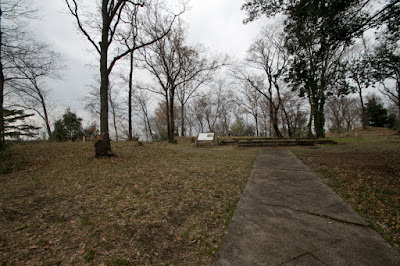 After the battle, Musashi Matsuyama castle had been kept by Hojyo clan. 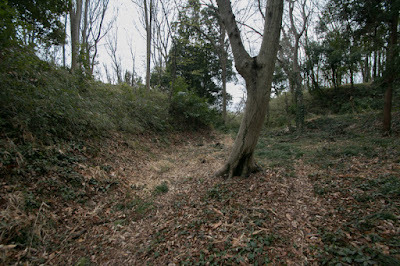 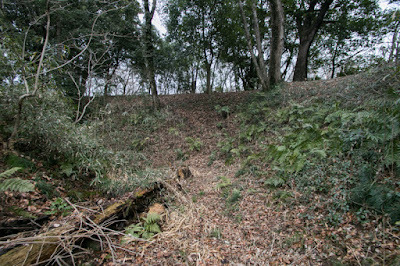 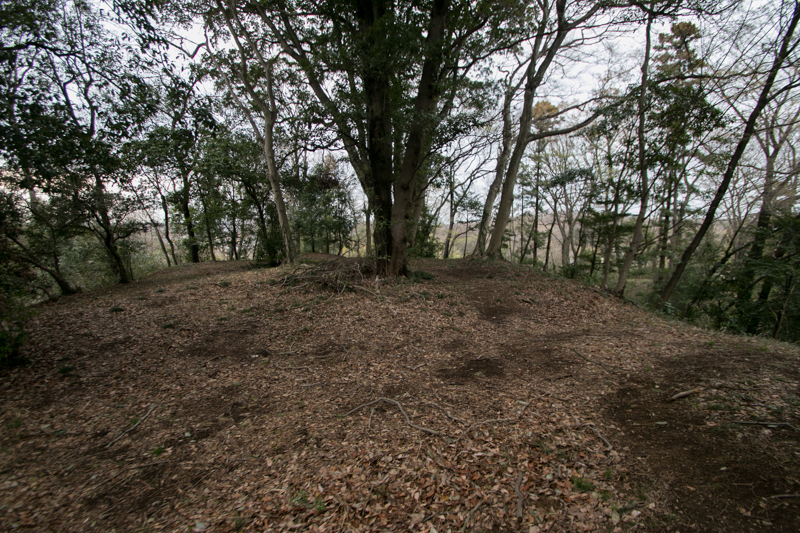 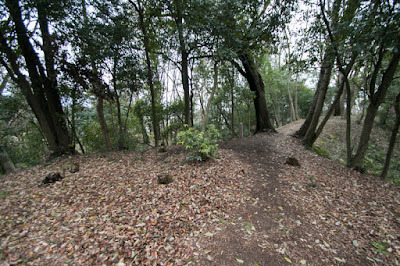 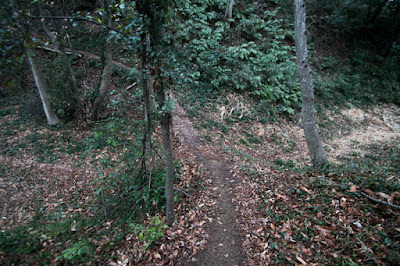 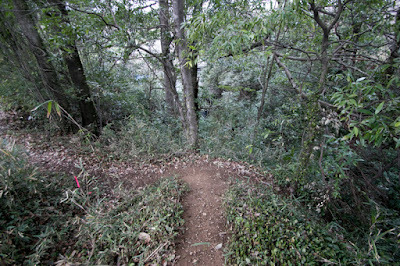 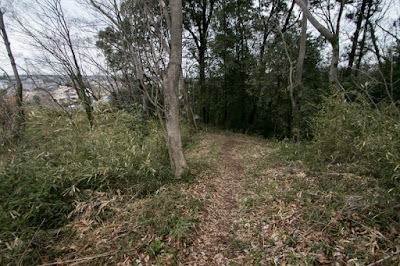 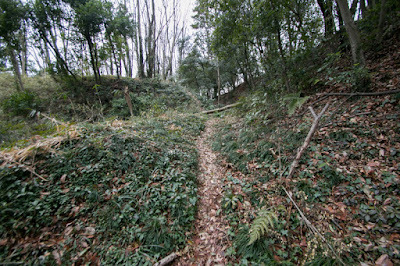 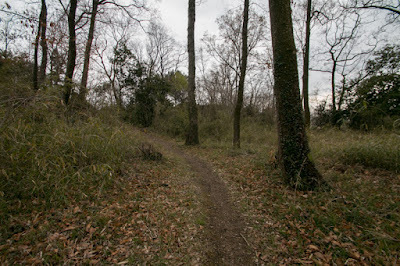 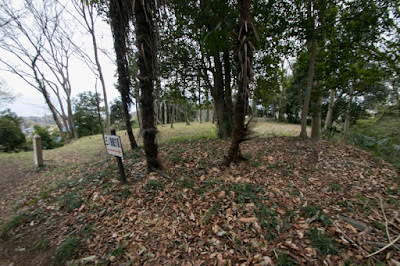 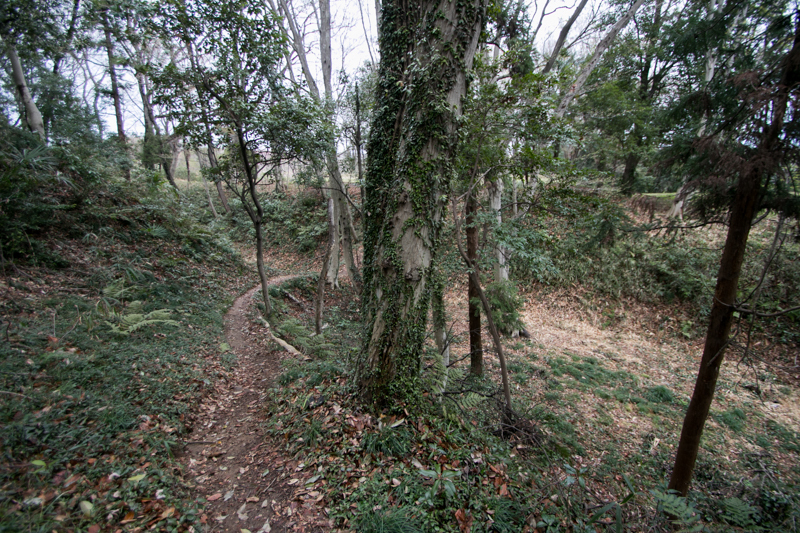 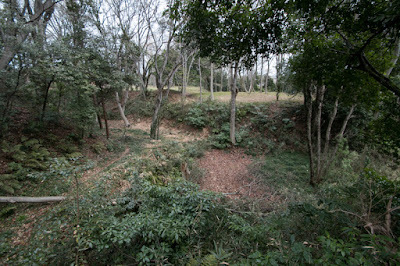 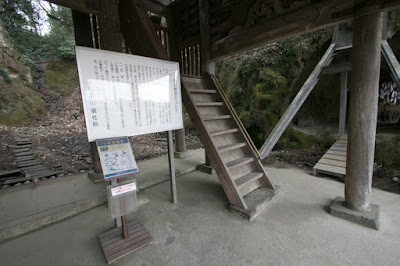 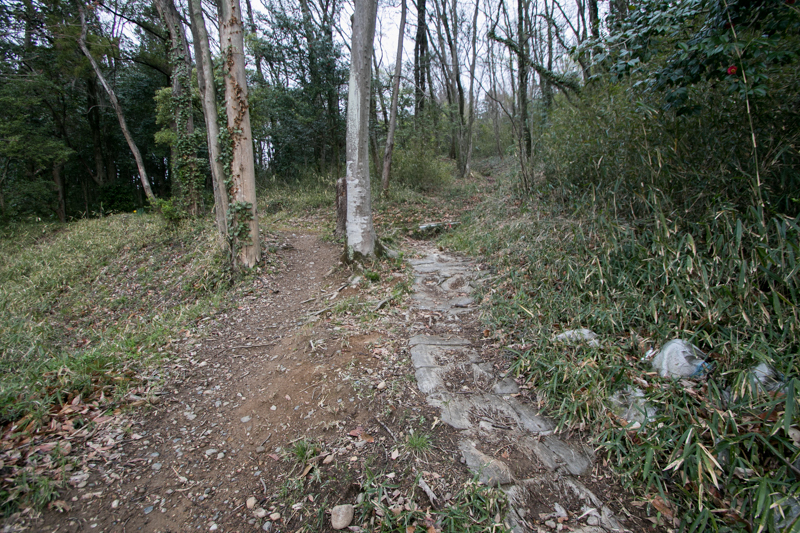 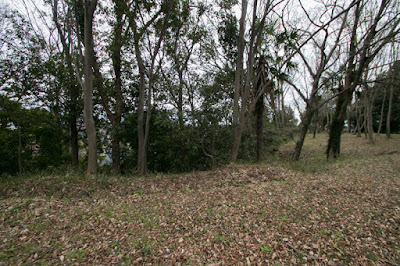 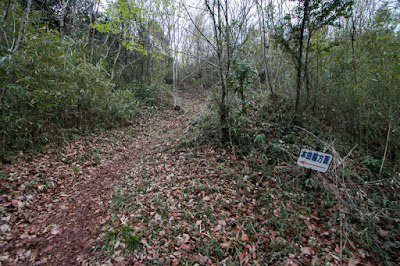 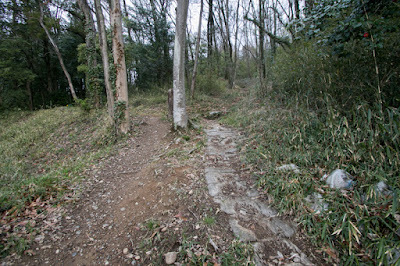 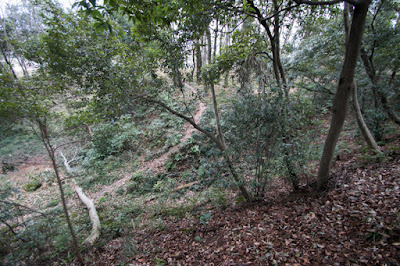 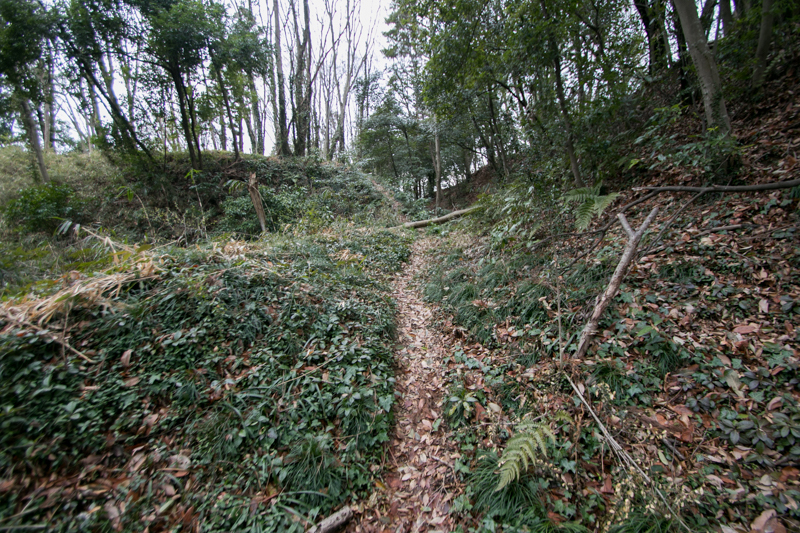 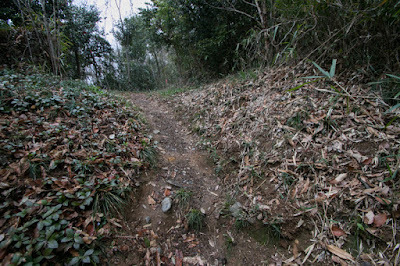 Kenshin once captured this castle but was recaptured by Hojyo clan soon. 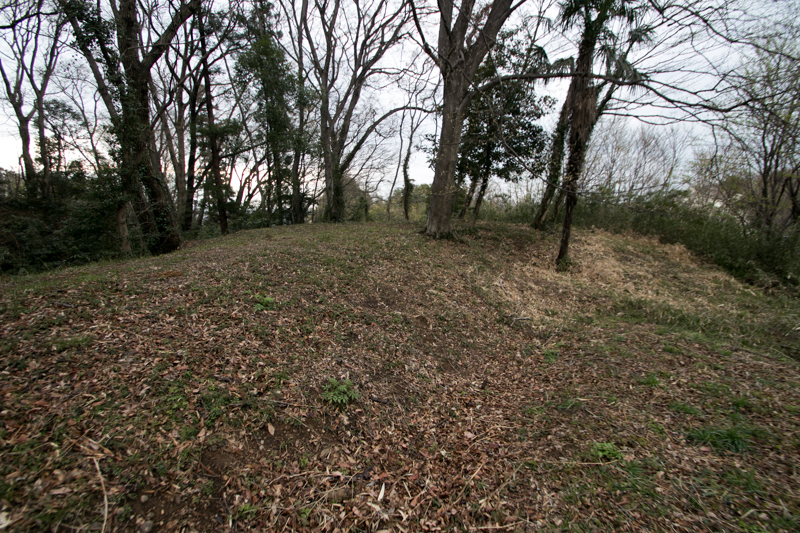 At the time of Odawara campaign by central ruler Hideyoshi Toyotomi (1537-1598) against Hojyo clan in 1590, this castle was attacked by 40,000 Toyotomi soldiers and opened without resistance. 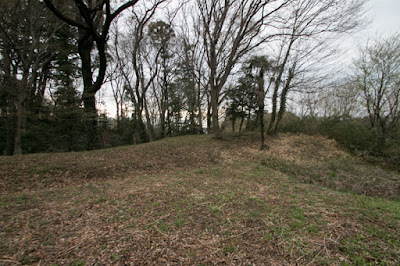 After the campaign this castle had been used until 1601, but was finally abolished. 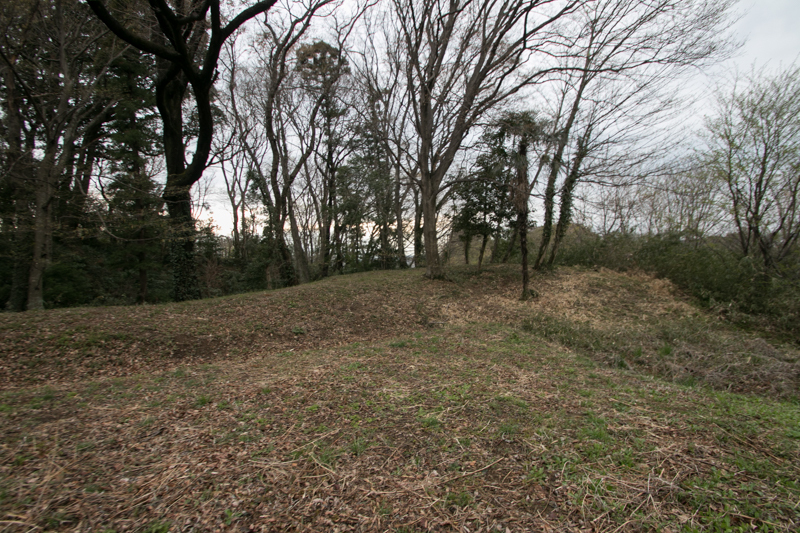 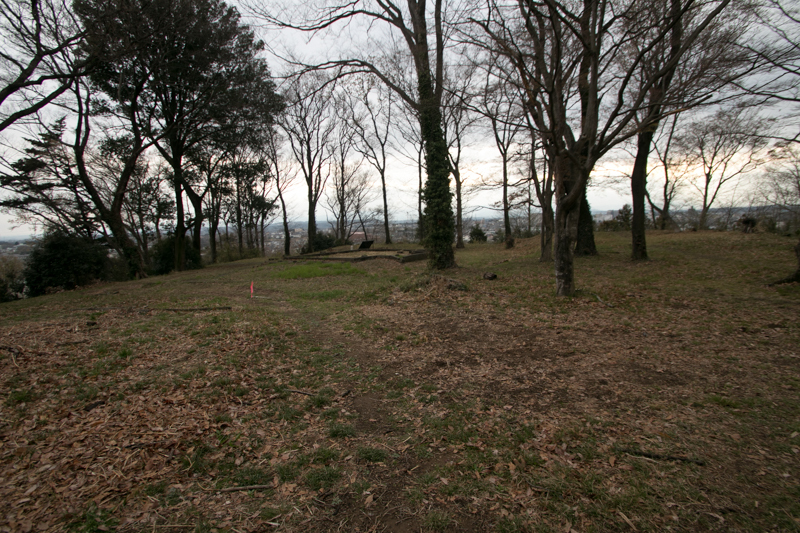 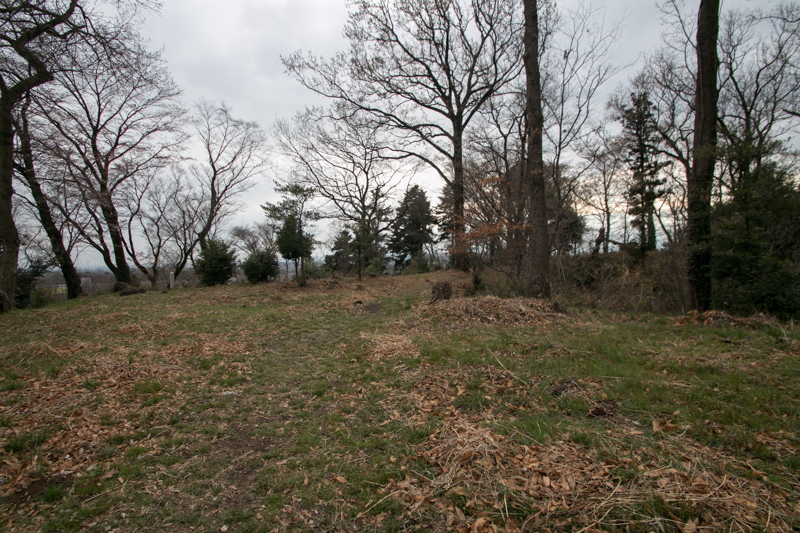 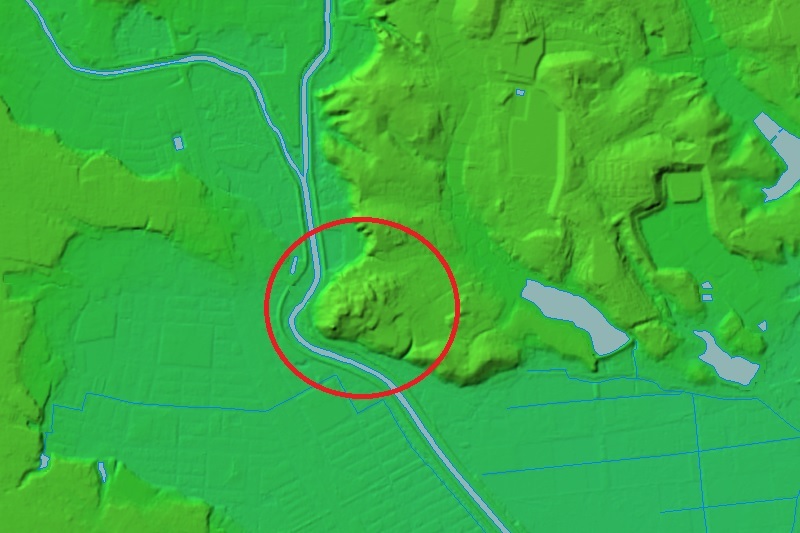 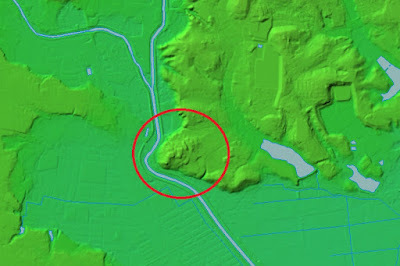 Now shape of each area and deep moats surrounded the hill well remain, and we can imagine the offensive and defensive battle developed among powerful warlords relating this castle. 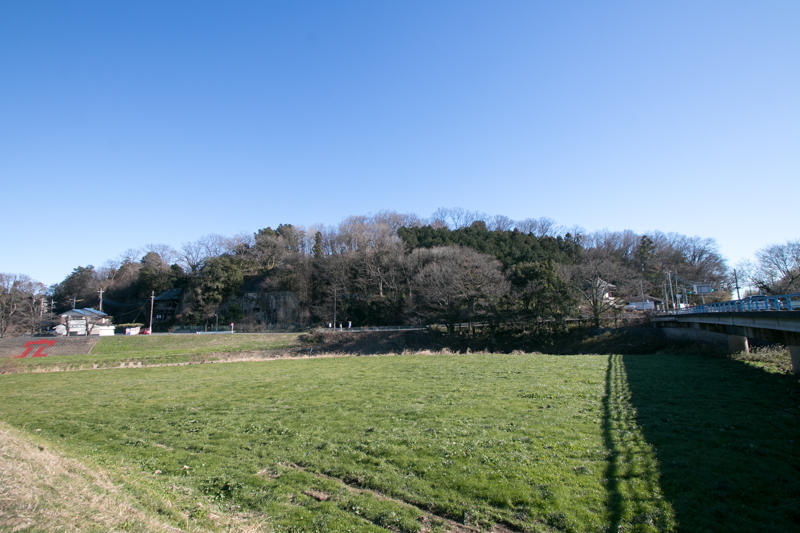 In 1998, Musashi Matsuyama castle was nominated as a national designated historical site collectively along with Sugiyama castle, Sugaya castle and Ogura castle. 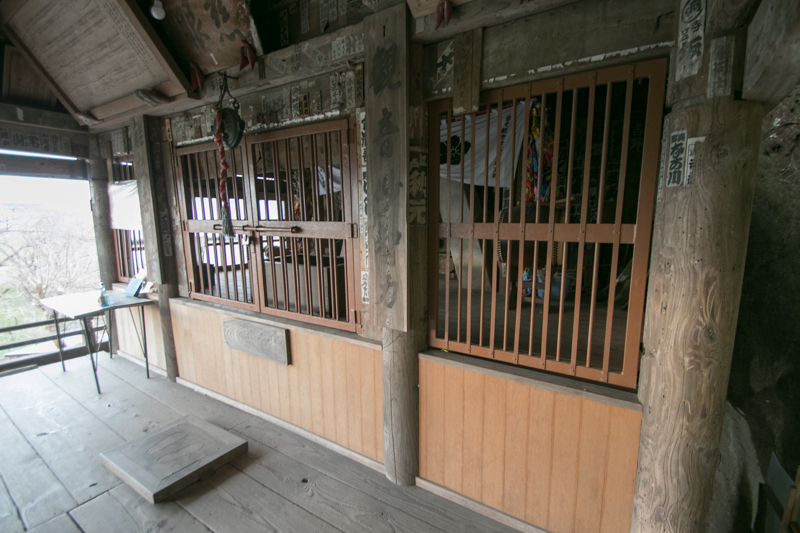 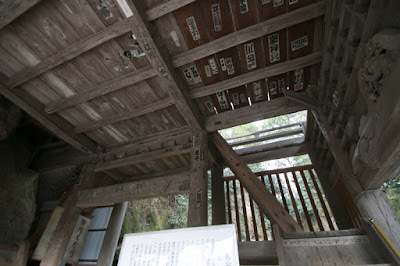 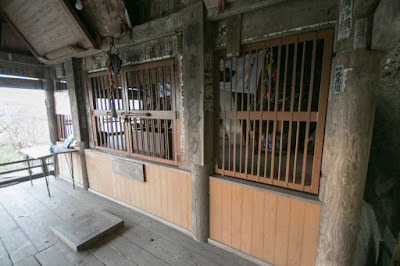 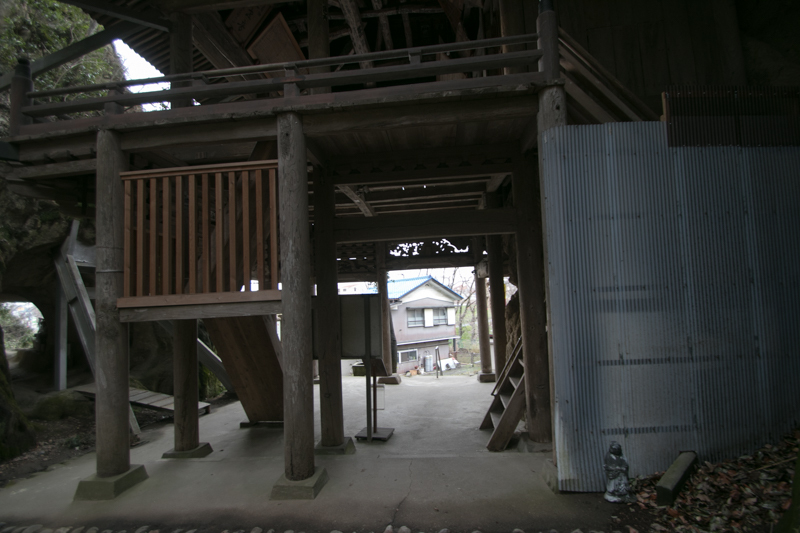 A wooden gate at the backside of the castle was built after the abolish of castle but is also as a valuable one. 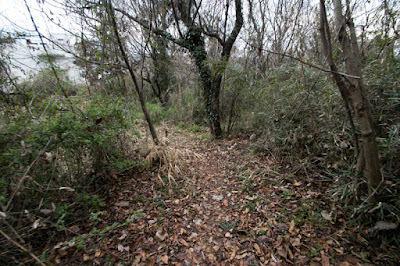 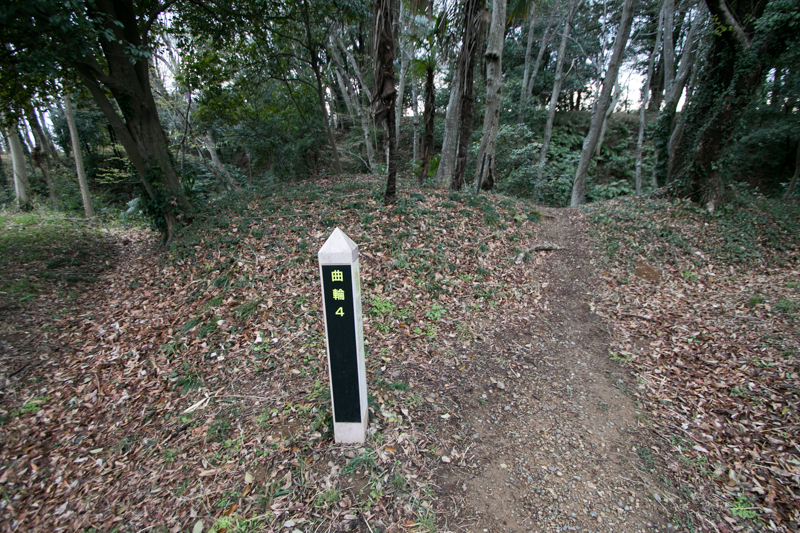 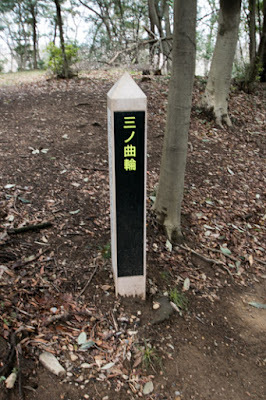 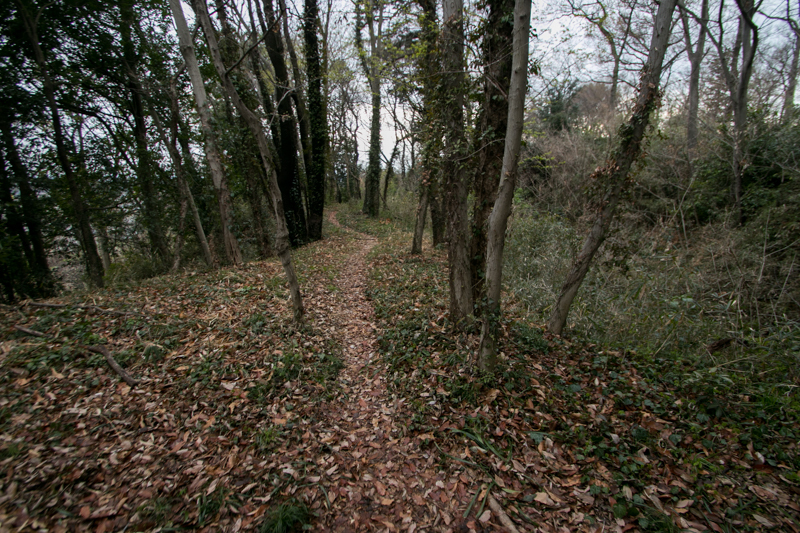 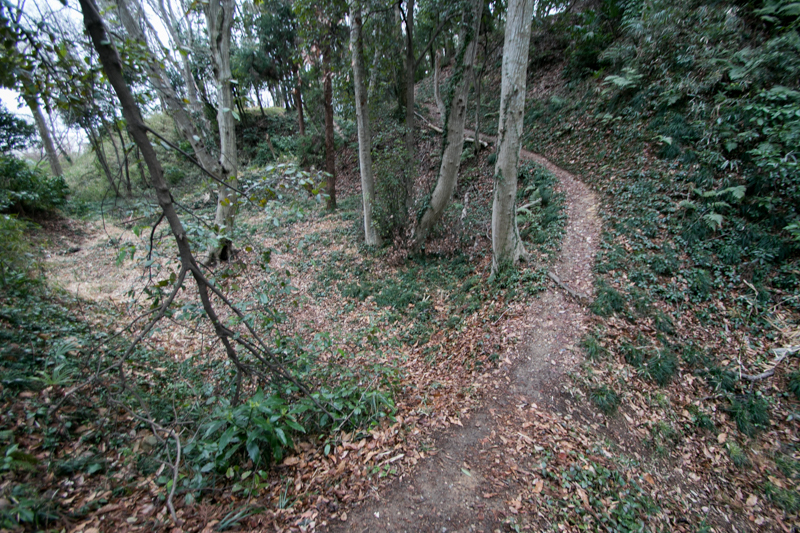 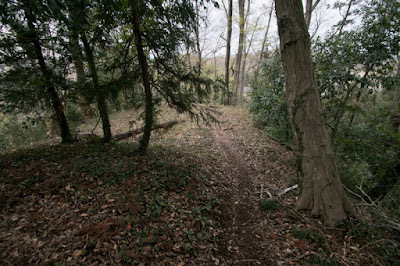 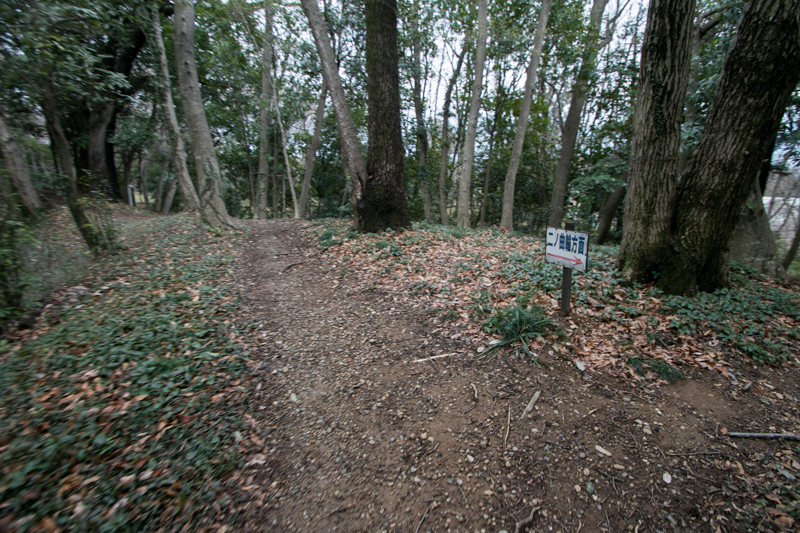 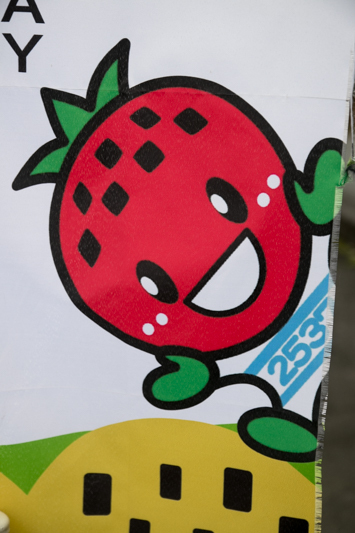 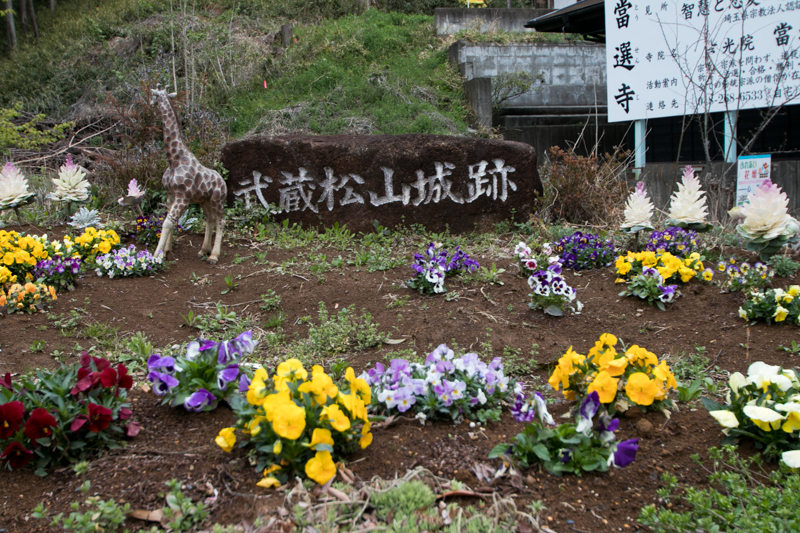 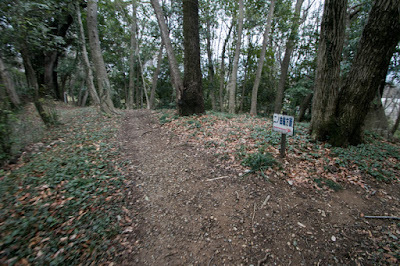 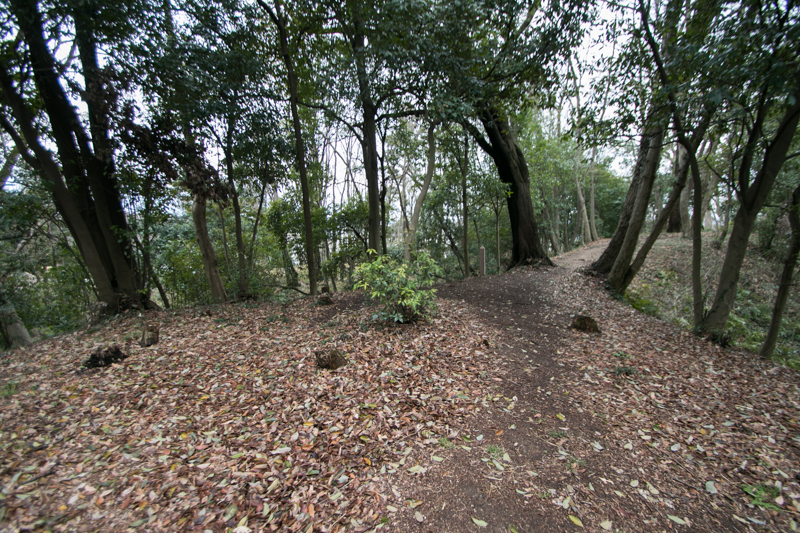 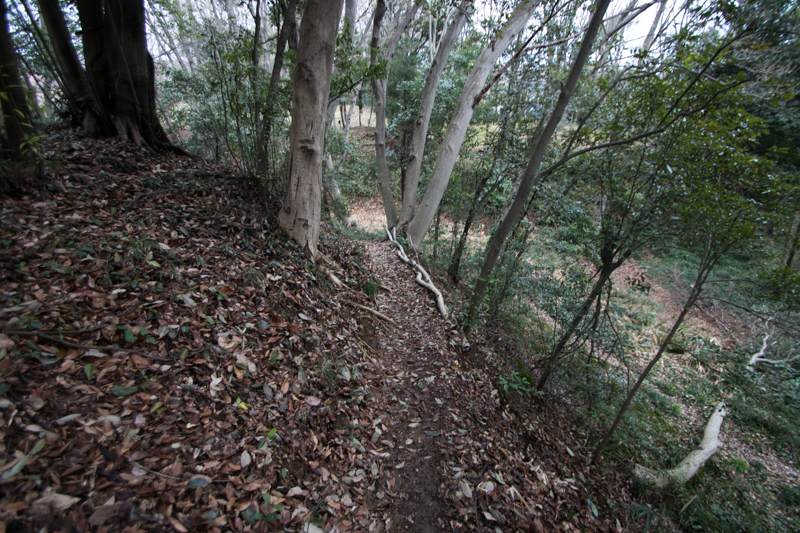 15 minutes walk from Tobu Tojo line Higashi Matsuyama station. 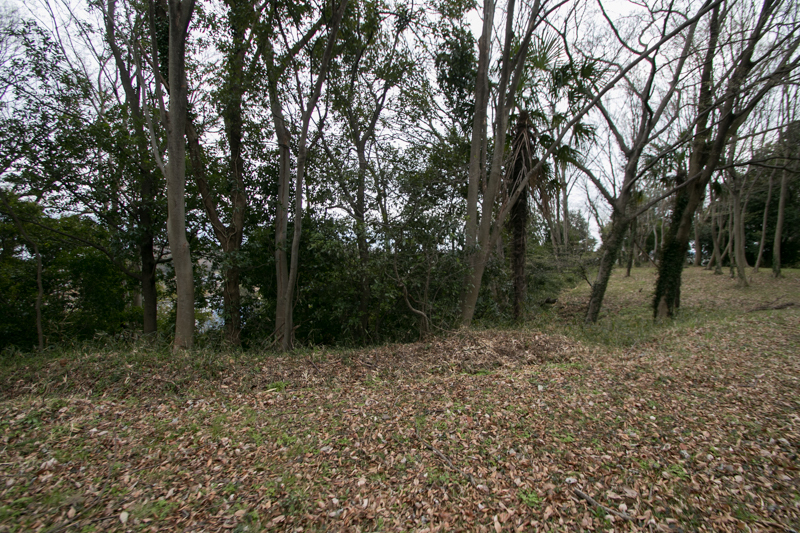 20 minutes drive from Kanetsu Jidoshado Expressway Higashi Matsuyama interchange.